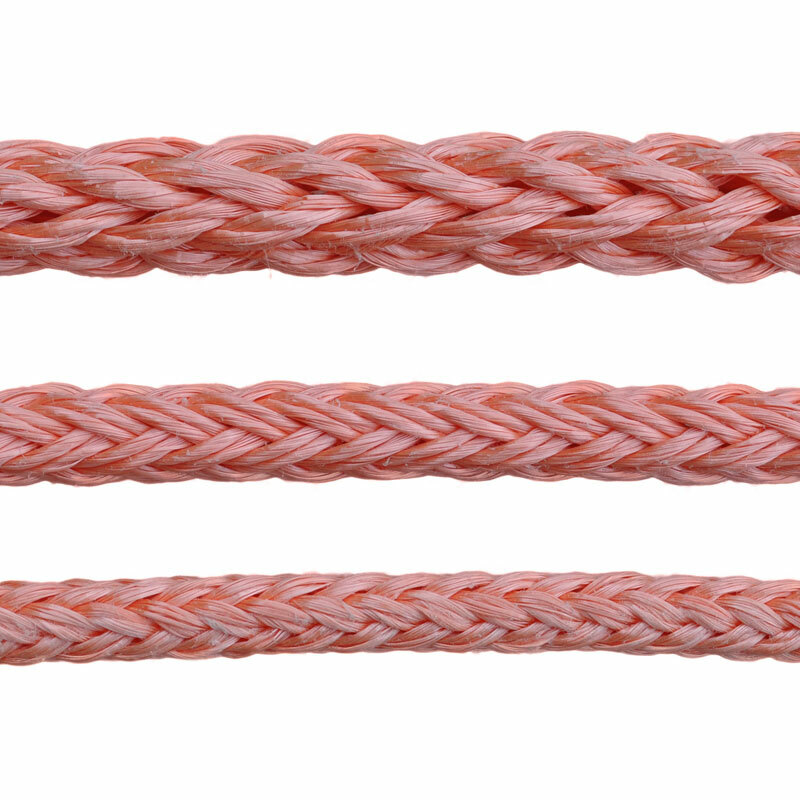 1/4" to 2" Double Braid Composite, High Force Pulling Line with 6" twine stitched eyes on each end. 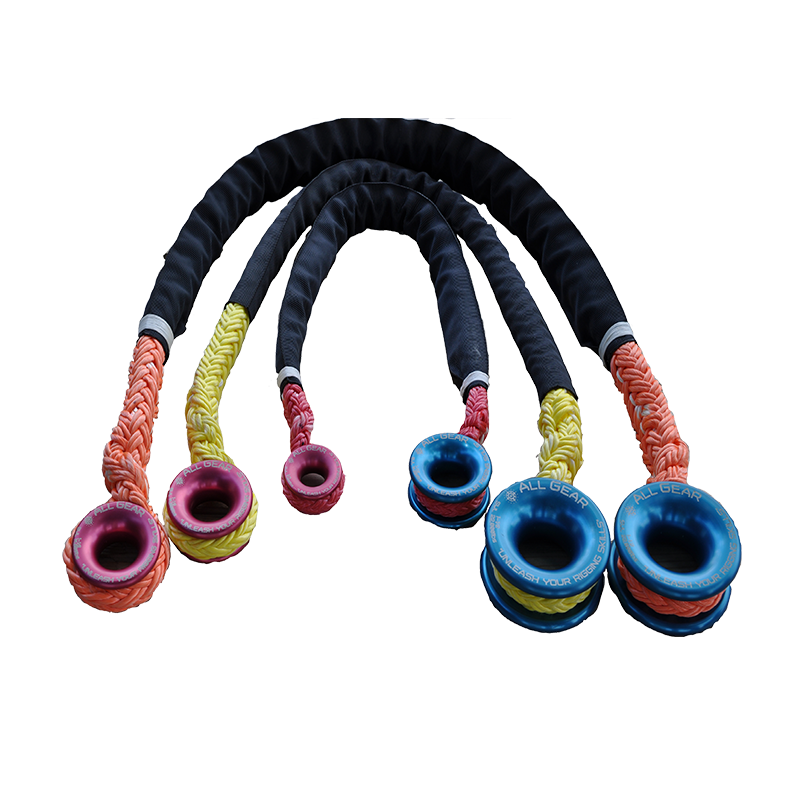 The braid is a combination of Polyester and Nylon. Tensile Strength = 2,500 lbs. to 150,000+ lbs. 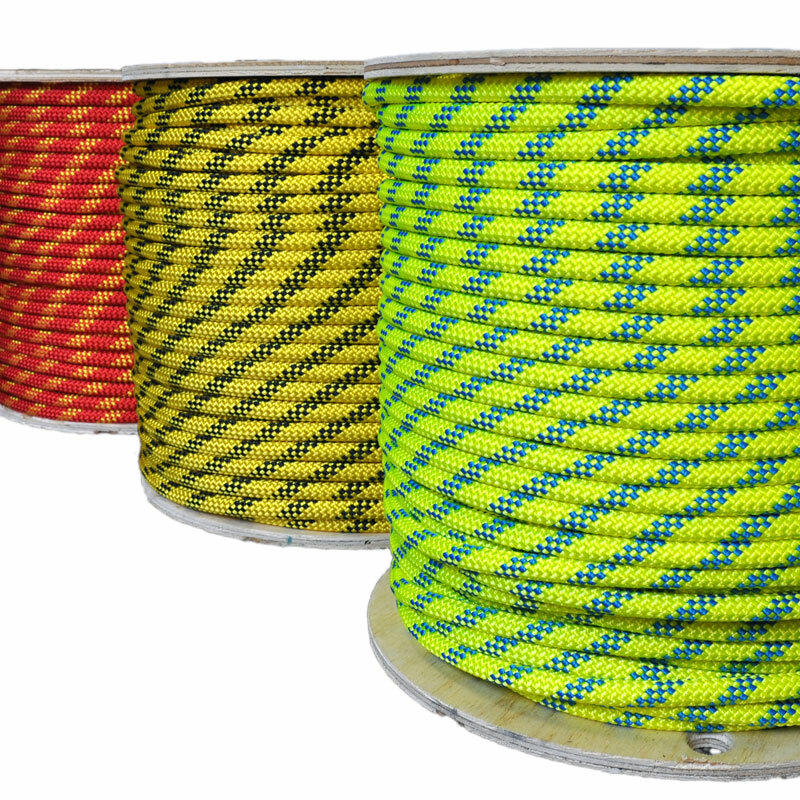 3/8" to 3/4" 3-Strand Twisted Polyester with 6" eyes on each end available in 300', 600' and 1,200'. 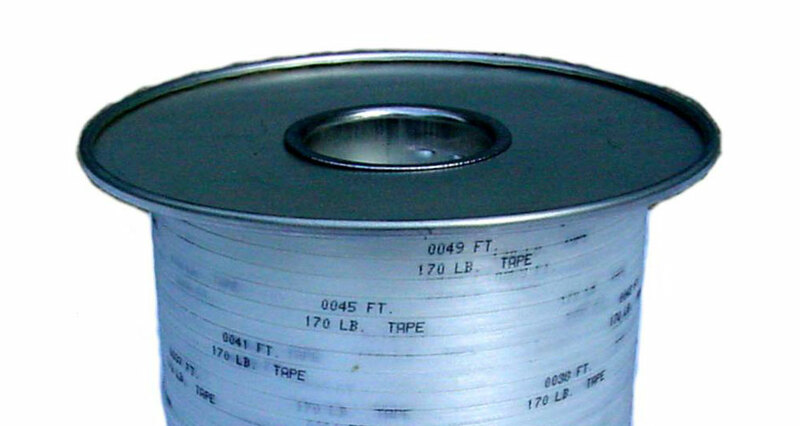 Polyester Pull Tape 1,250 lbs., 1,800 lbs. and 2,500 lbs. Pull Tape marked sequentially every foot for measurement. 3,000' and 5,000' Lengths are available. 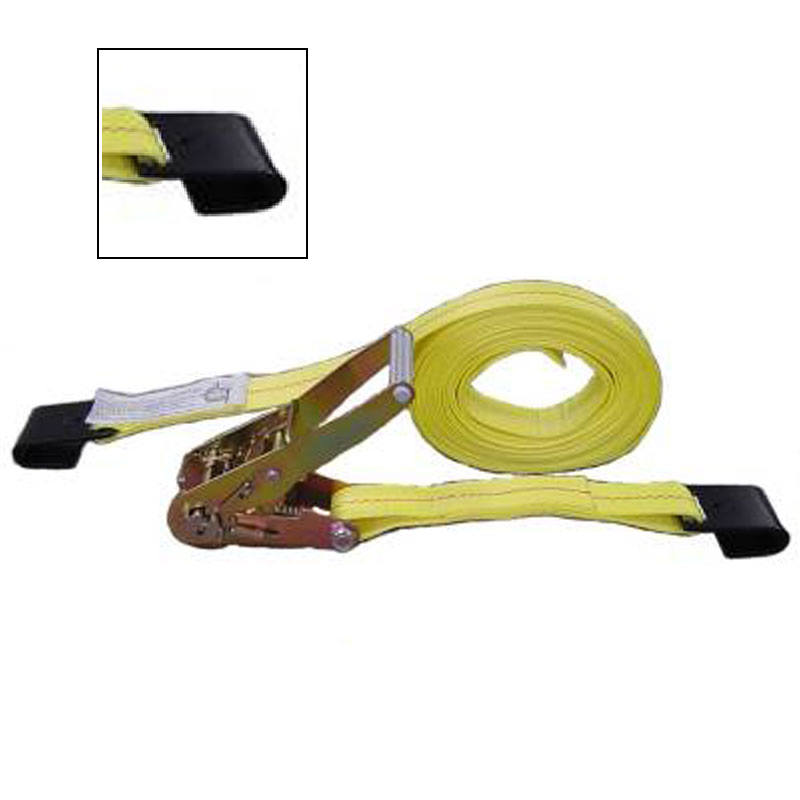 A low stretch lifting tool for contractors. 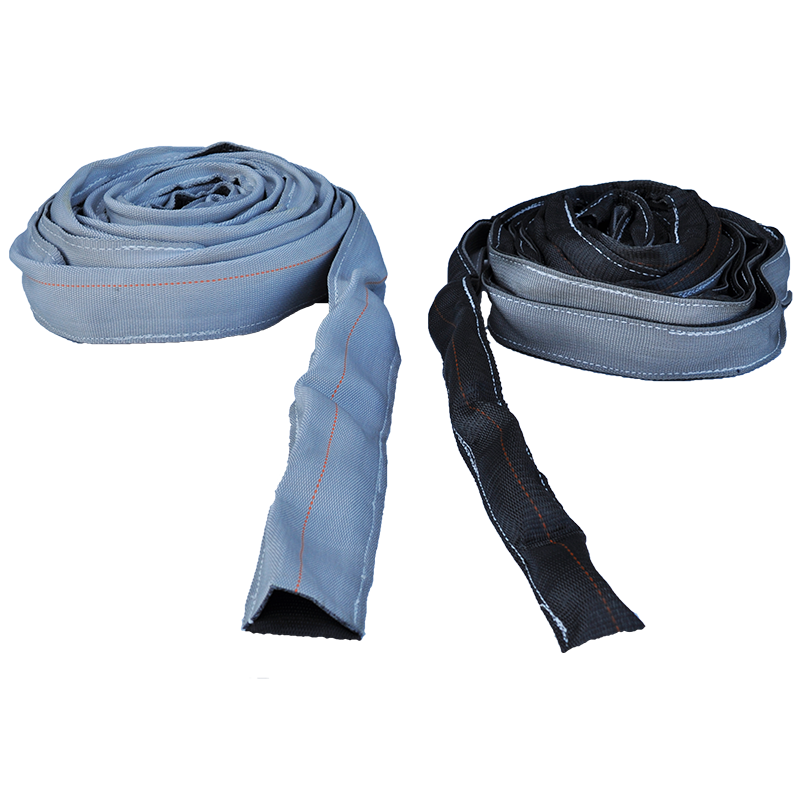 Our Adjustable Polyester Transformer Slings feature a Ballistic Nylon Chafe Sleeve at 3 Critical Wear Points. Premium Husky Urethane Coating. 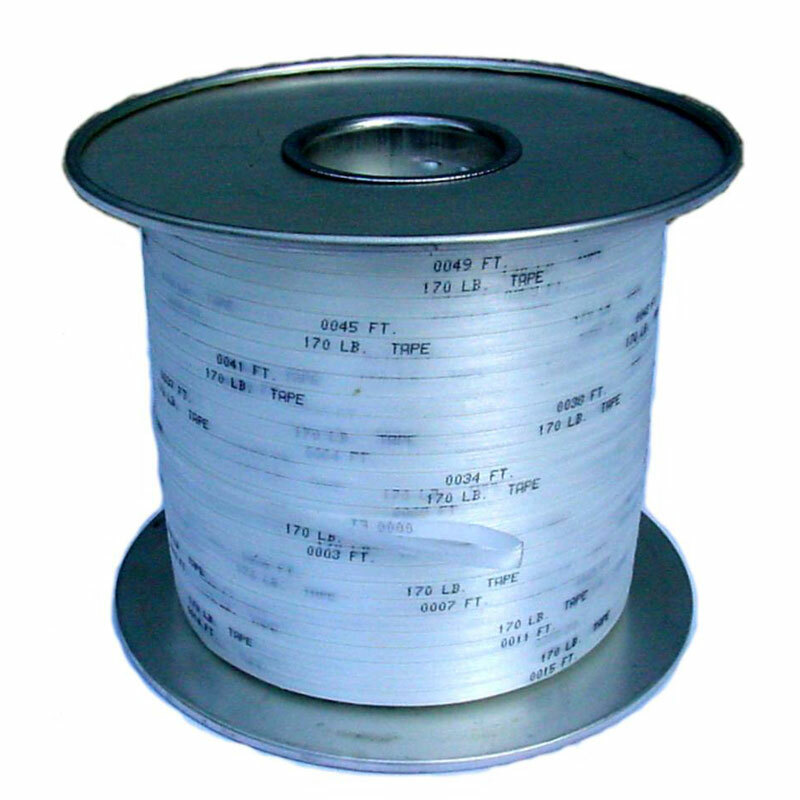 3/8" to 5/8" 12-Strand Polyolefin Dielectric Line is great for minimal electrical connectivity. 100% Polyolefin High Tenacity Copolymer insures high strength. 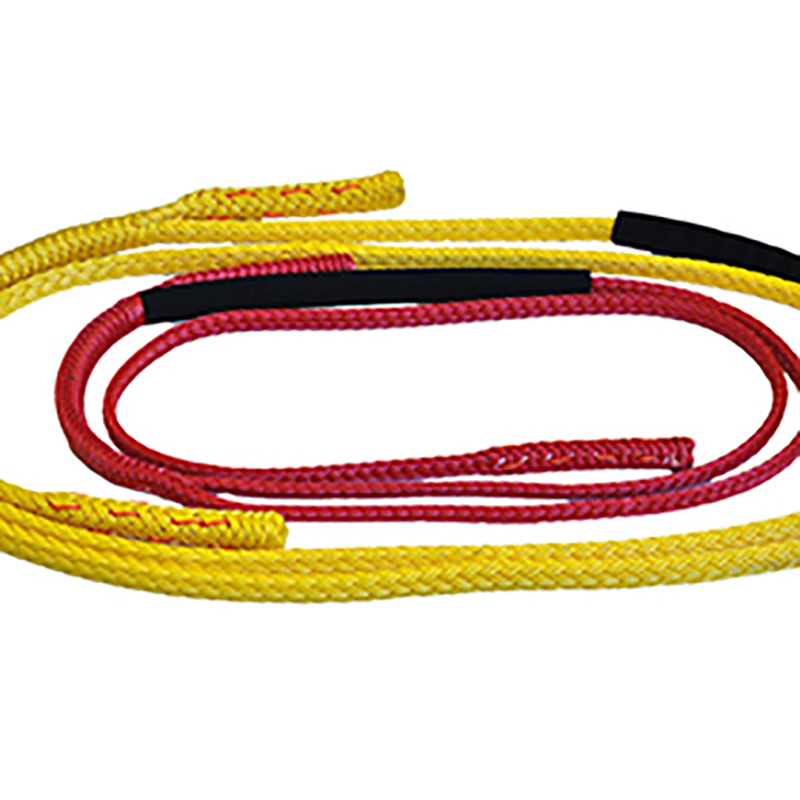 20% stronger than standard yellow polypropylene lines. 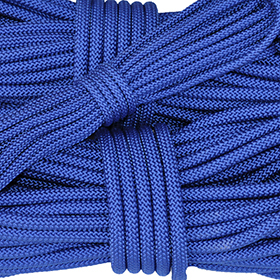 1" and 1-1/8" Polyester over Polyester, 12-strand core and 20 Carrier Polyester Jacket. 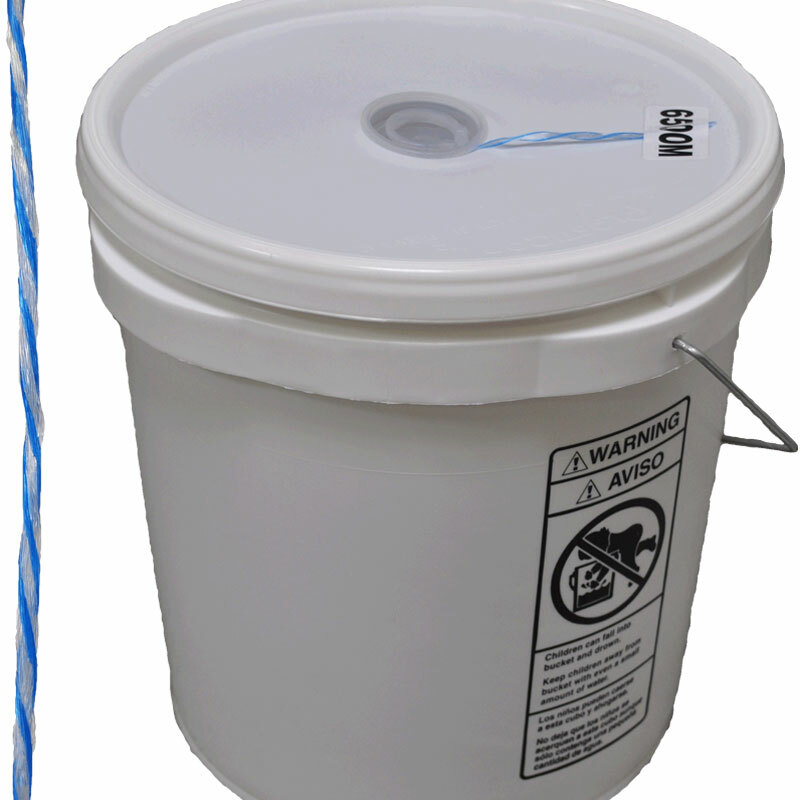 Husky Urethane Coating avaible for abrasion resistance. 12-Strand Twisted Composite - Polyester over Polyolefin in each strand. Pololefin keeps the center dry for minimal electrical conductivity. 3/16 - 4" diameters. 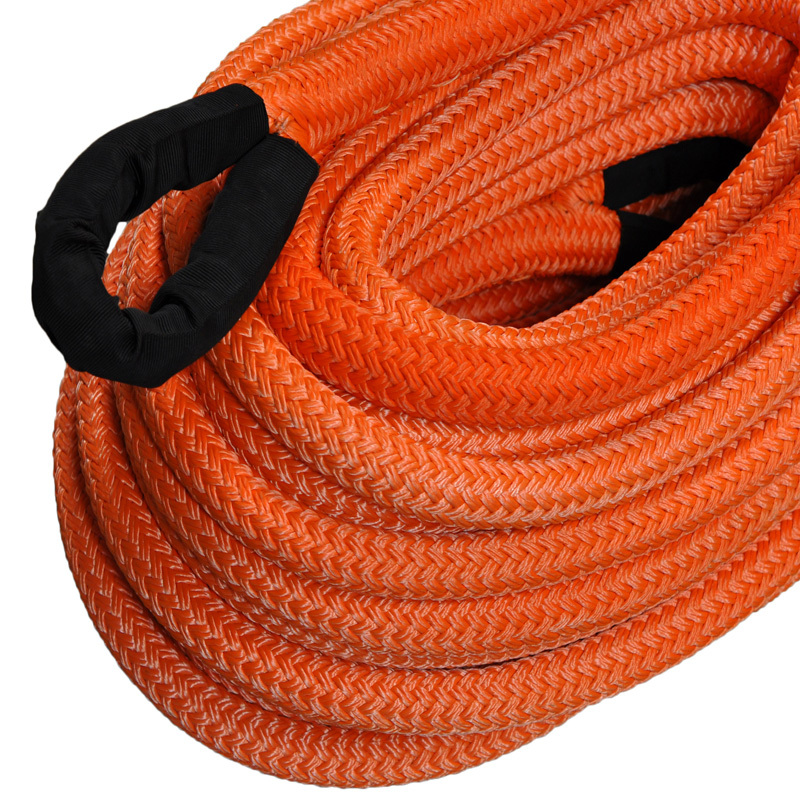 3-strand twisted composite high strength polyester with polypropylene core. 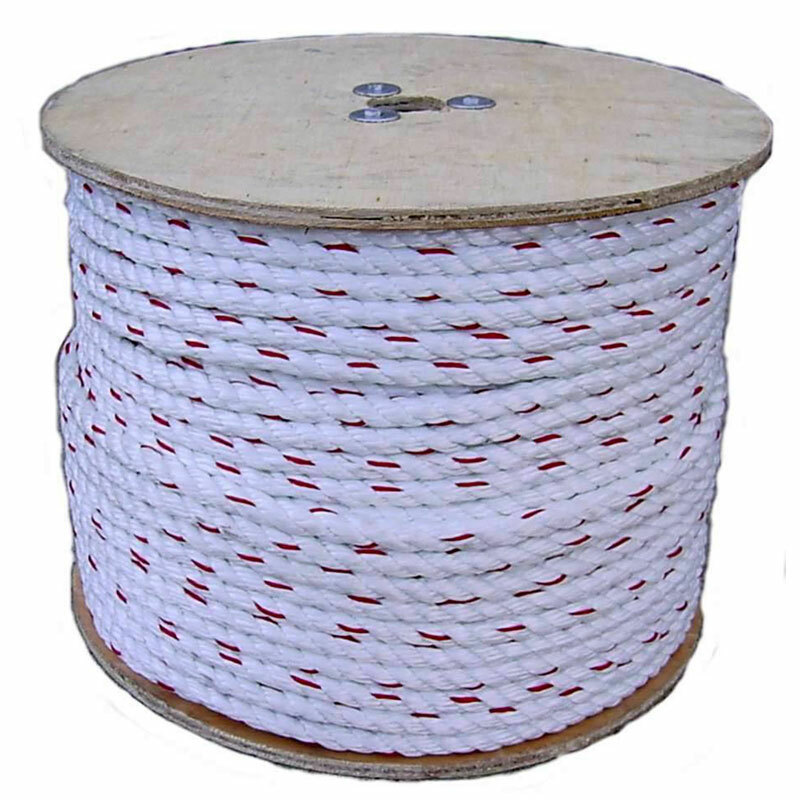 Excellent for general purpose, Roofing Anchor Lines, Industrial Lifting, and Replacing other polyproplyene twisted lines. 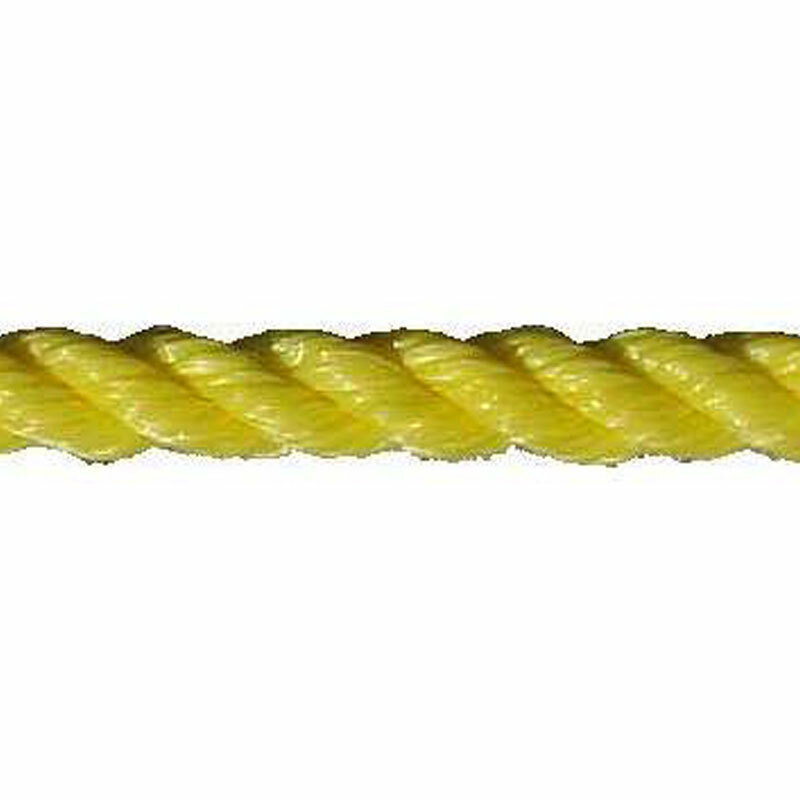 3-strand twisted high strength composite bull rope. 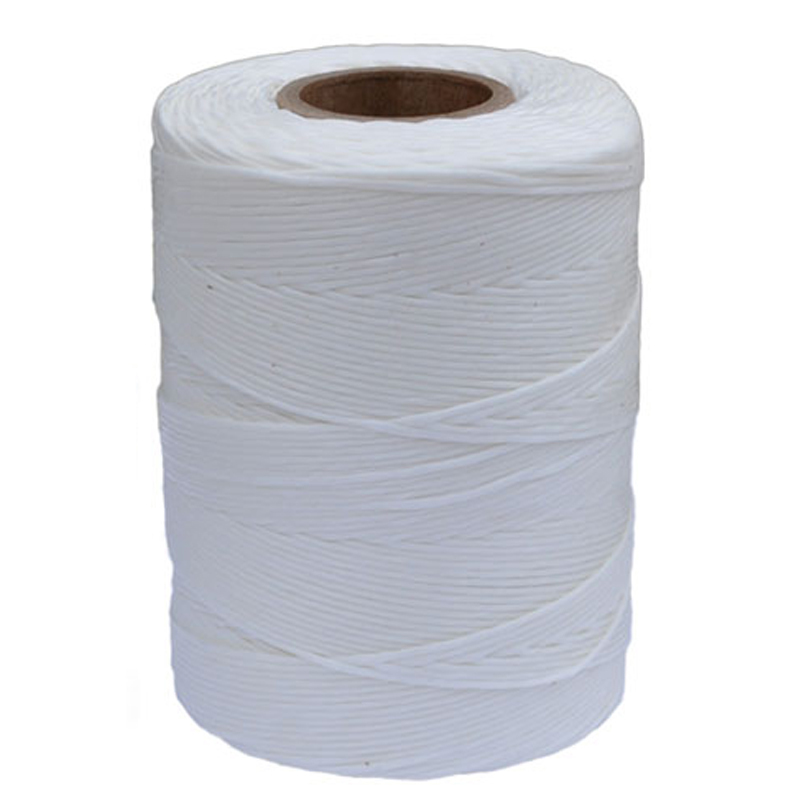 100% Plied polyester jacket insures durability and the high strength co-polymer core gives you excellent break strength. 20% stronger than standard poly dac lines. 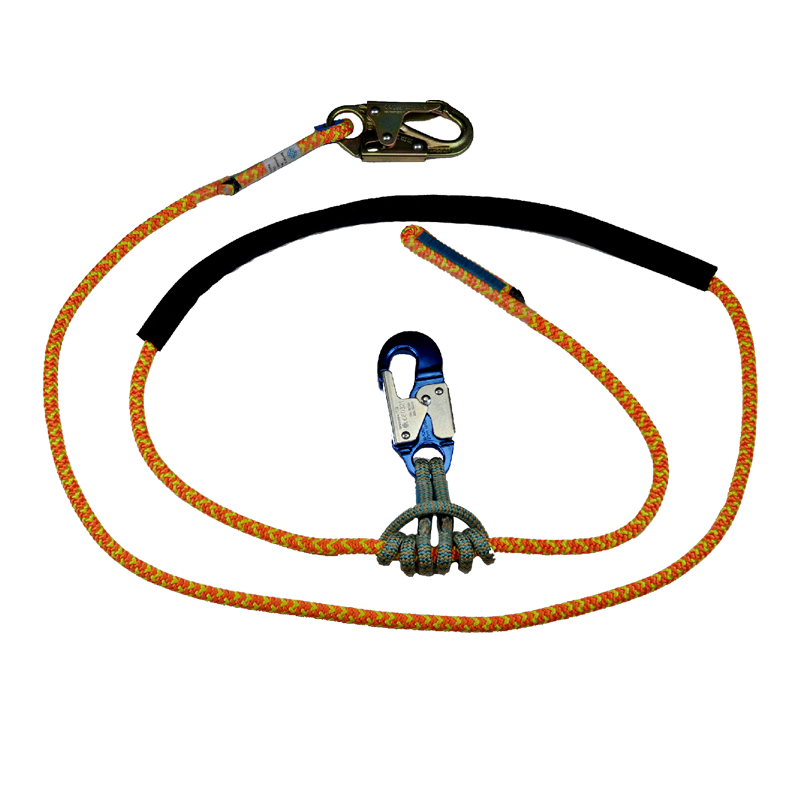 A 32-Strand Polyester Rappelling / Tower Line. 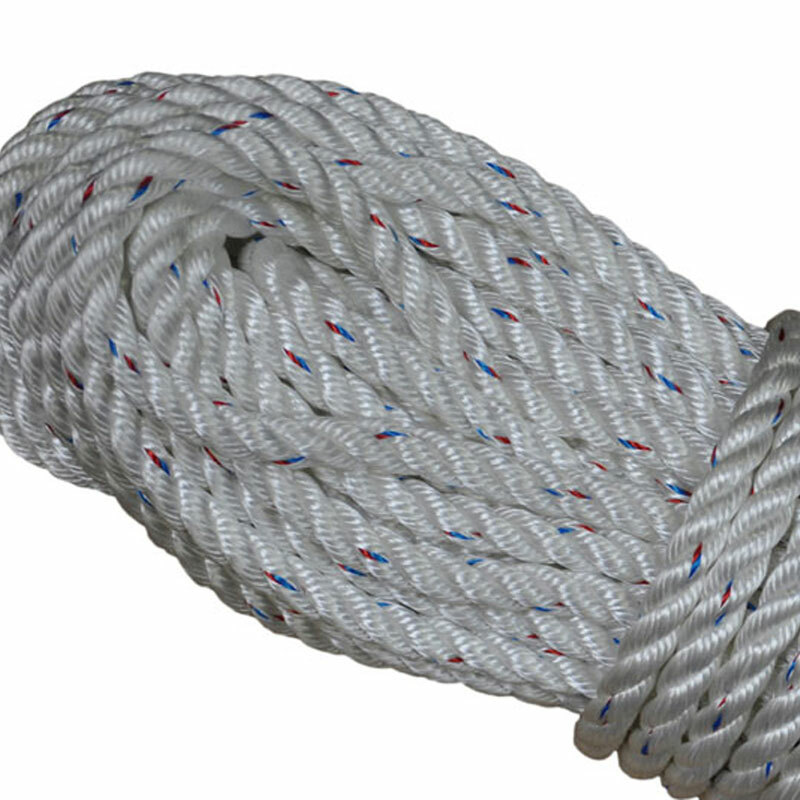 A Firm Construction and a Straight Core make this rope great for Rappelling and Tower Work with Blocks. 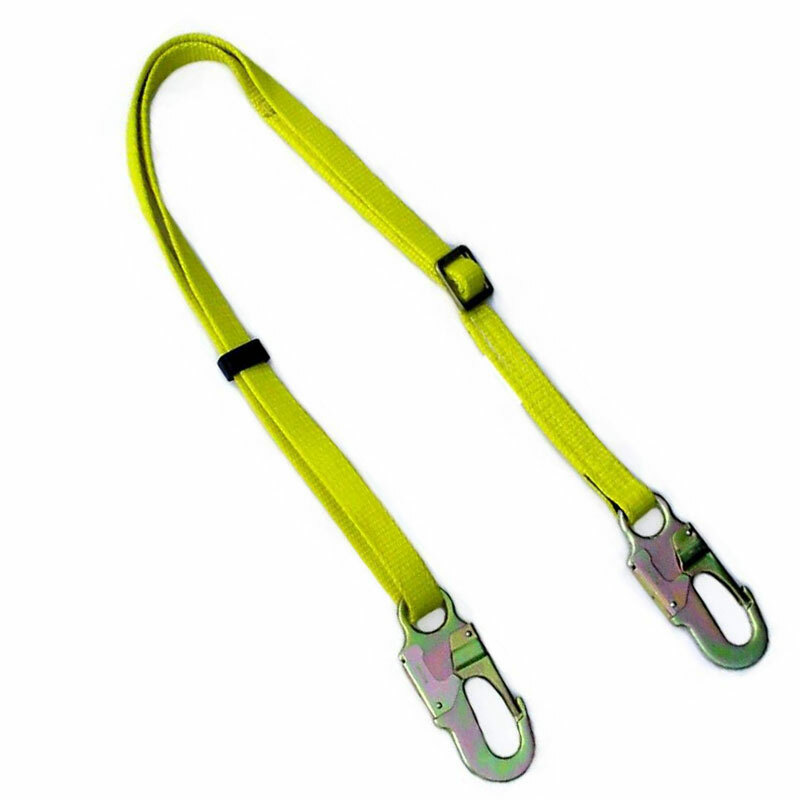 Bright Tower Line™ provides you the ability to increase safety and a 32-Strand Polyester Cover keeps the line very durable for high performance. 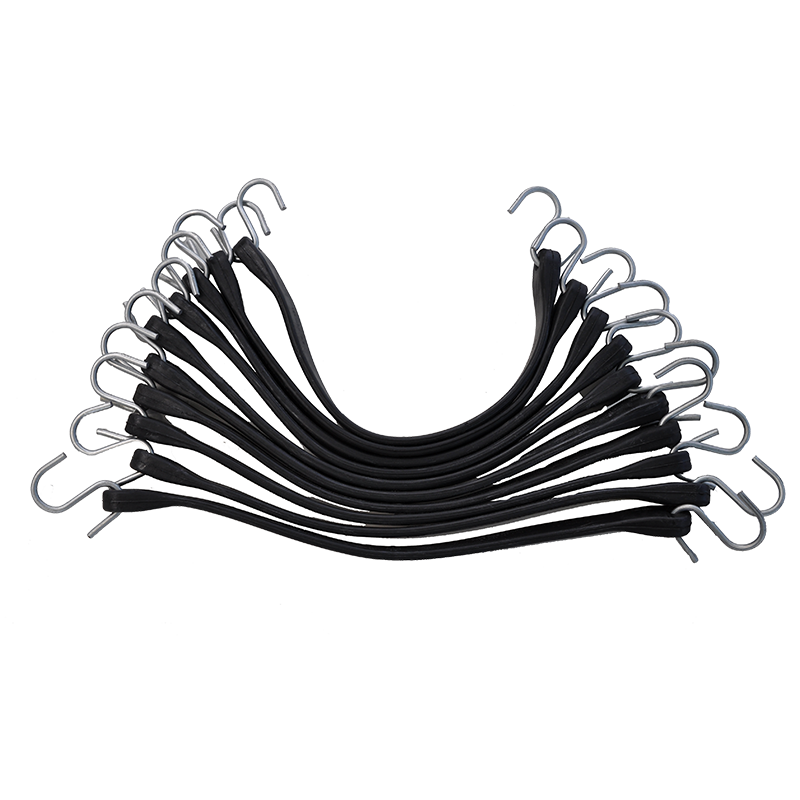 3/16" - 2" 3-Strand Twisted Polypropylene. 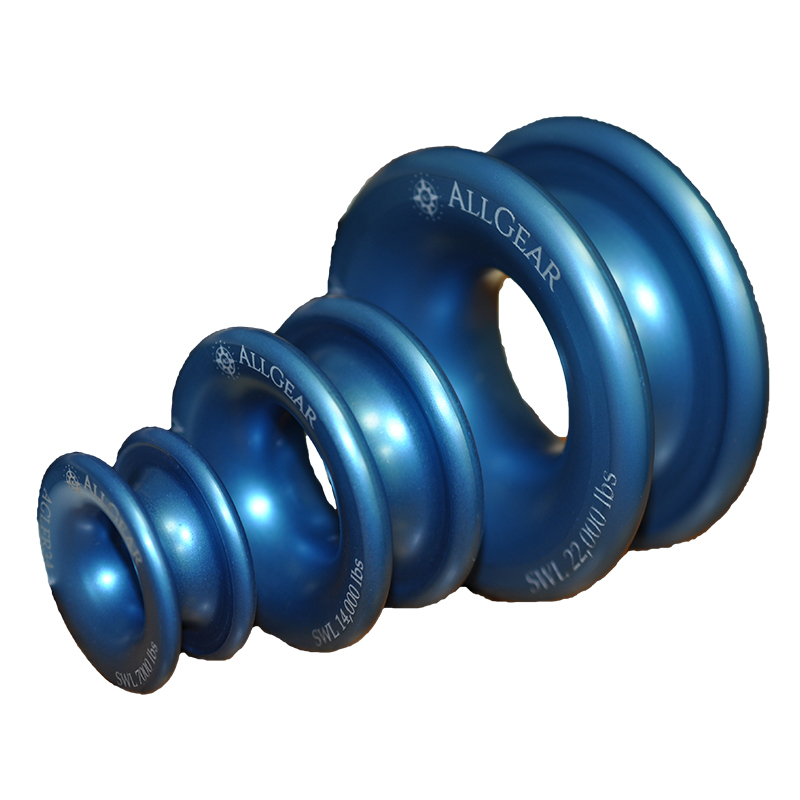 High Strength and Good Elasticity. 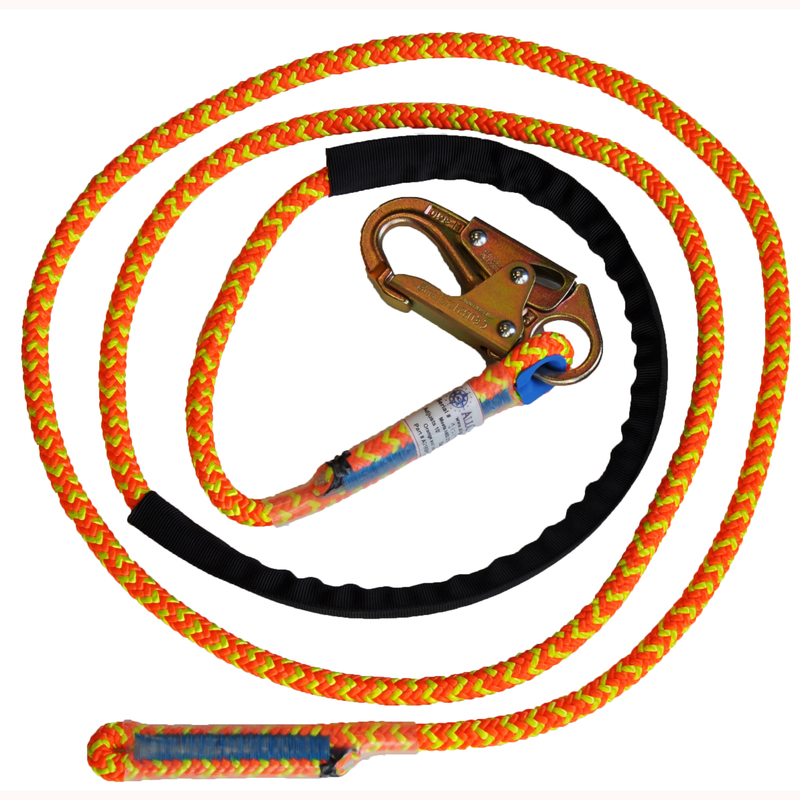 Excellent for genearl purpose, medium duty pull line, barrier rope, and pool rope. 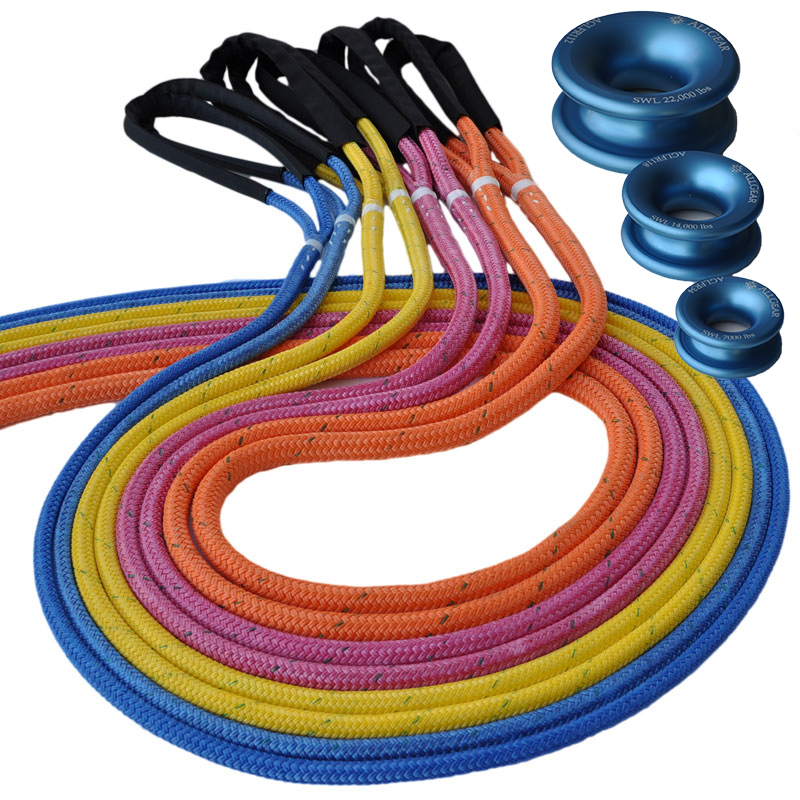 All Gear's SRS's are made out of Premium Husky 12™ Polyester with Multicolored Strands. 3' adjustable Chafe Sleeve for protection. 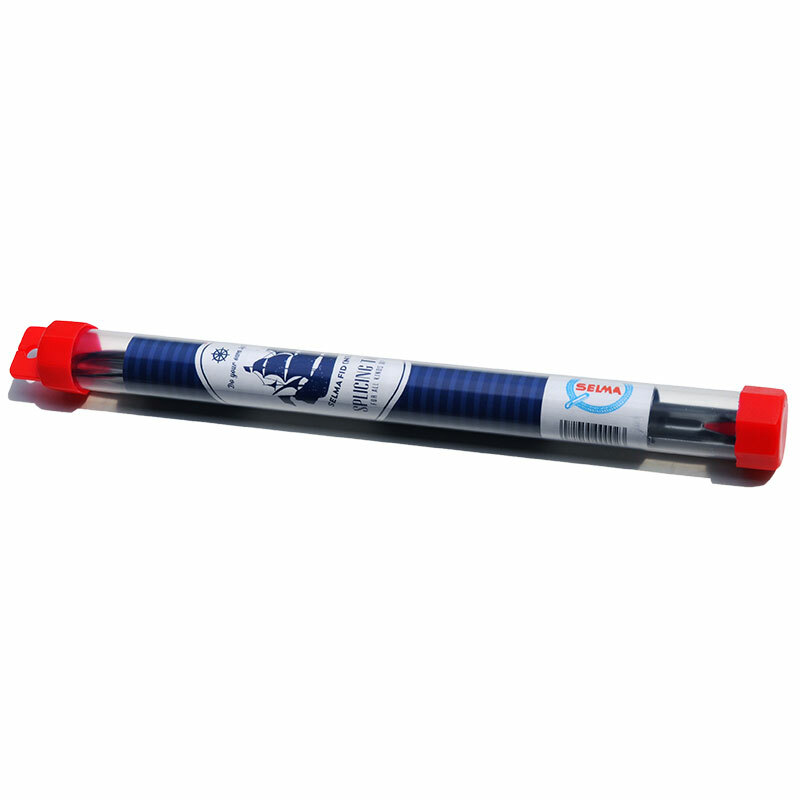 All Gear's SRS's are made out of Premium Husky 12™ Polyester and Low Friction Rings Coated Blue and Red for Glide. 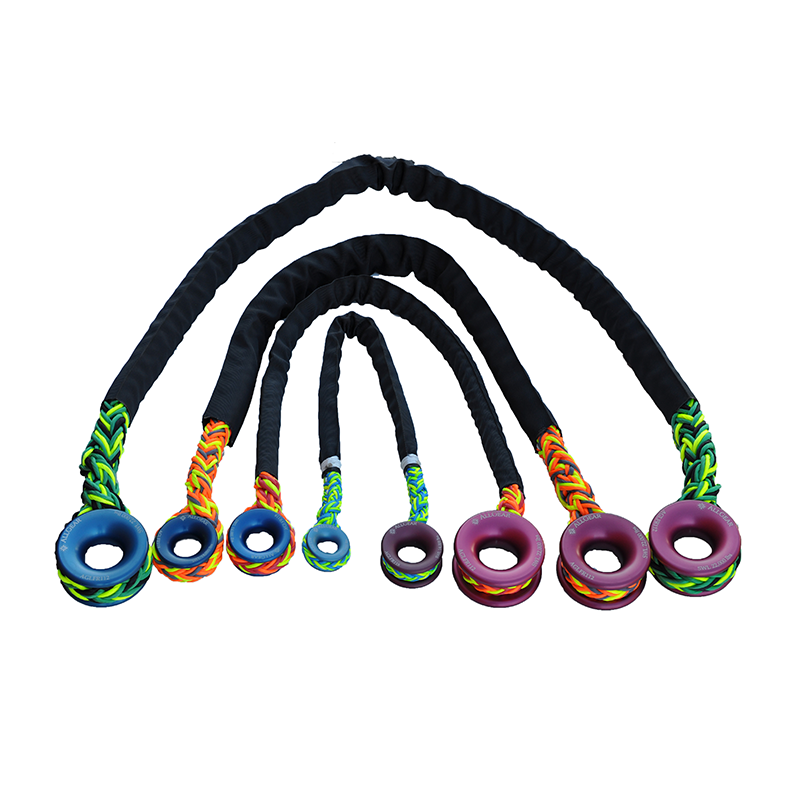 Our Ring to Ring slings are made of 12-Strand Multicolored Polyester coated in All Gear's Husky Coating and covered with Chafe Sleeve. 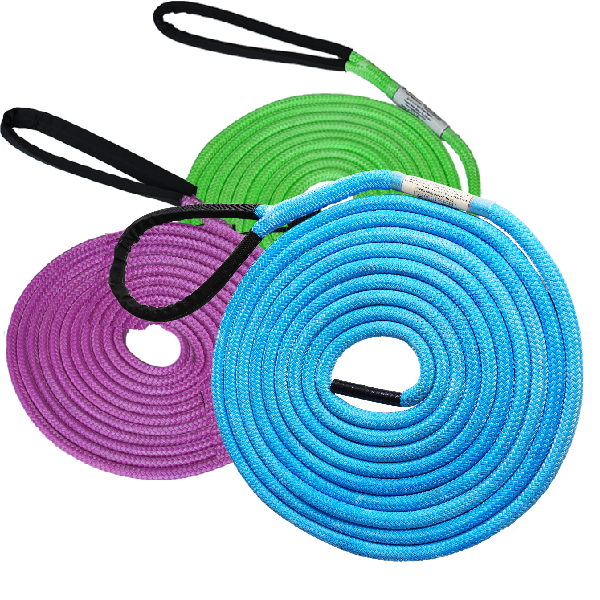 All Gear's Pro Force Crane Sling™ is available in 1/2" Purple, 9/16" Neon Green, and 5/8" Silver Pro Force™ Bull Rope in lengths of 15', 20', 25' or 30' - Custom lengths available - contact us for more details. 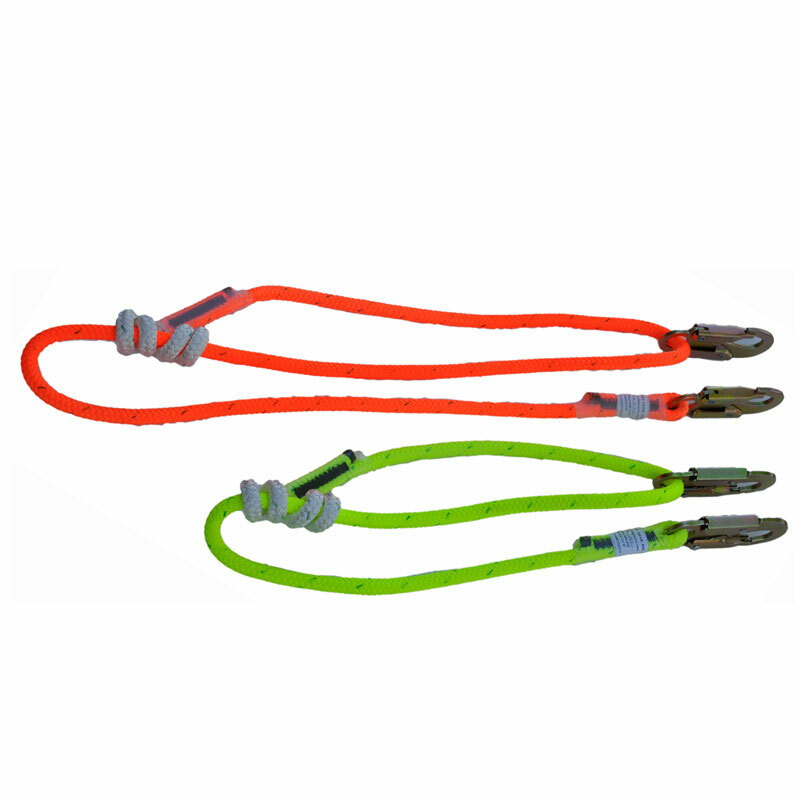 All Gear's Rope Chain Slings are made of our Husky 12™ 12-Strand Polyester Rope with 10 rig pockets. Color coded for each size. 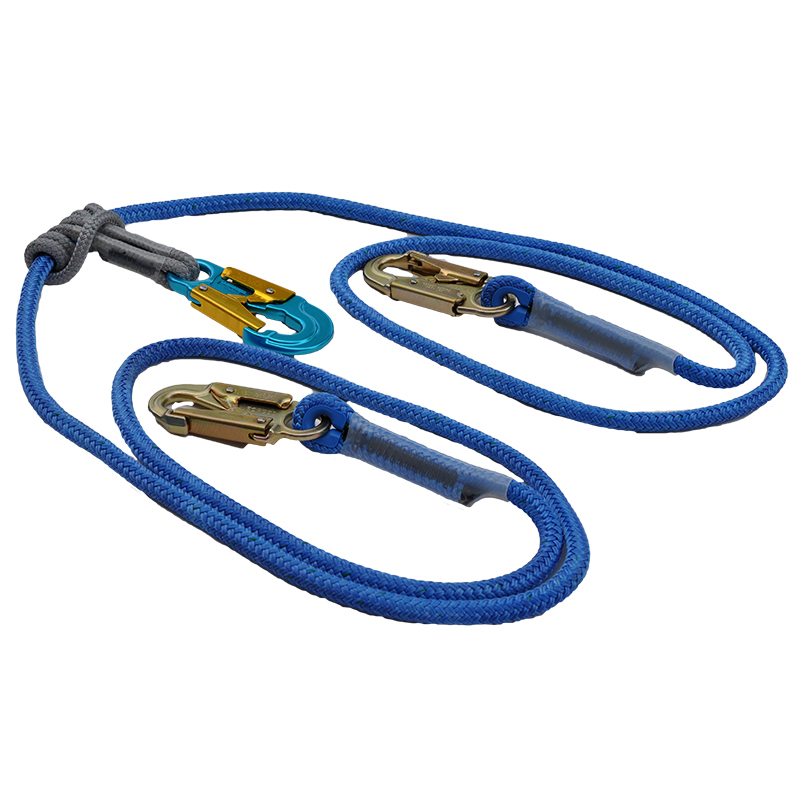 All Gear's Ring to Ring Slings are made of our Husky 12™ 12-Strand Polyester Rope with one Low Friction Rigging Ring on each end - installation from the ground. Color coded for each size. Husky Double Braid Ring to Ring Sling. 2 Low Friction rings with a 30% Splice for added strength. 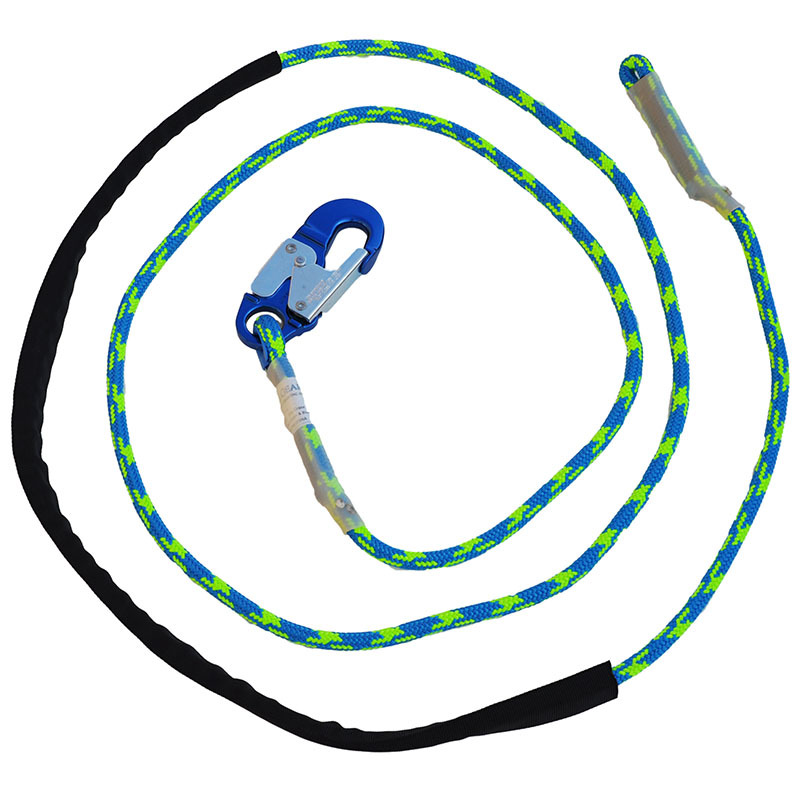 Husky Bull Rope offers great Shock Absorption. Ring to Ring Sling with Double Head. Install from Ground. 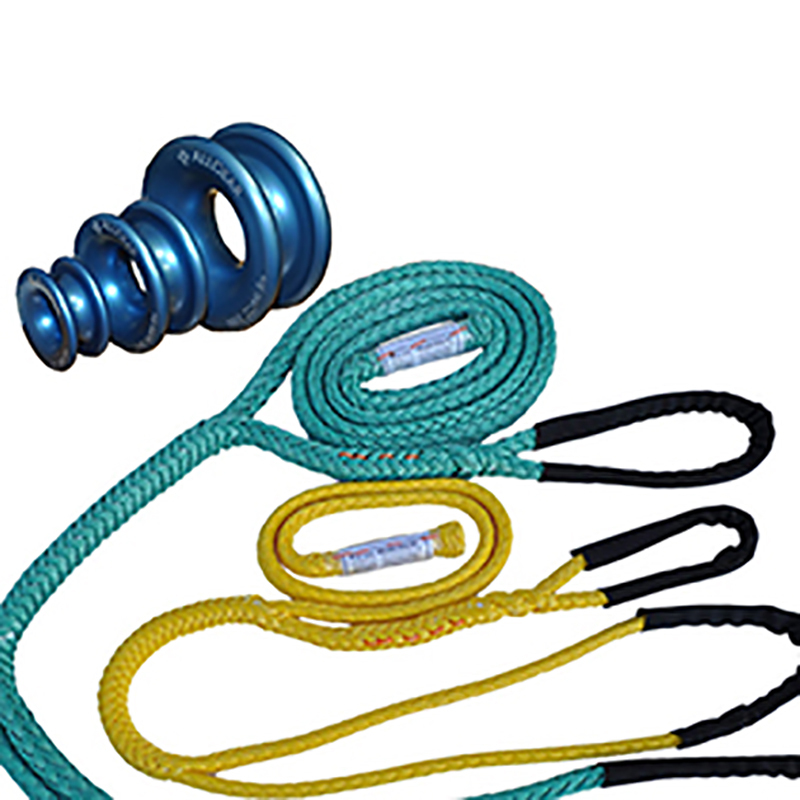 All Gear's Ring to Ring Slingswith Double Head are made of 12-Strand Husky Bull Rope with one Low Friction Rigging Ring on each end. Custom order any size. 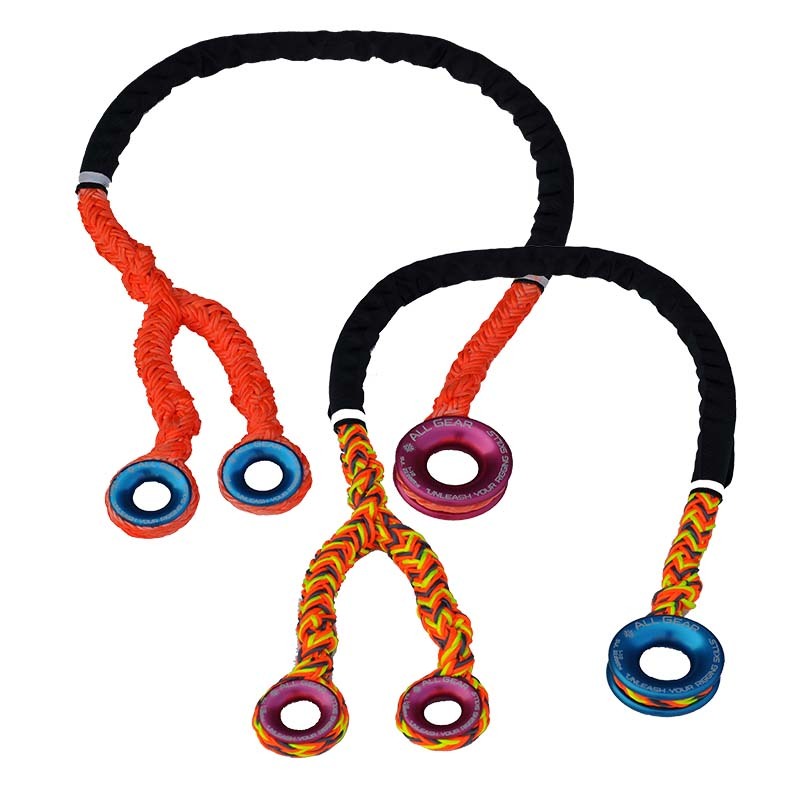 Double Braided Composite Eye Slings provide the best in abrasion resistance, break strength and energy absorption. 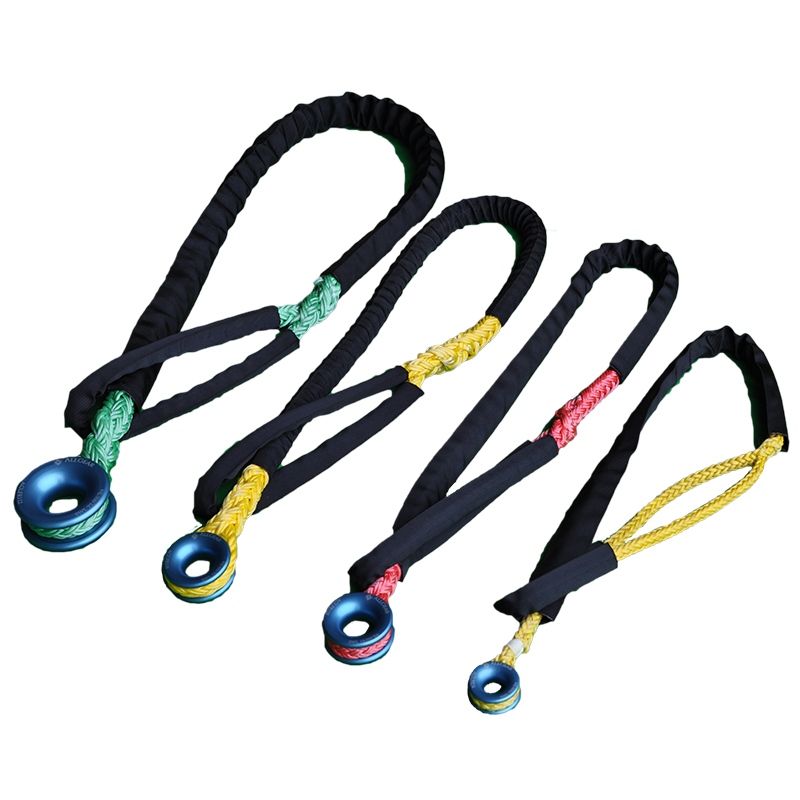 The Bull Rope Eye Sling's have a Heavy Duty Nylon Outer Jacket at the Eye for Extended Life. 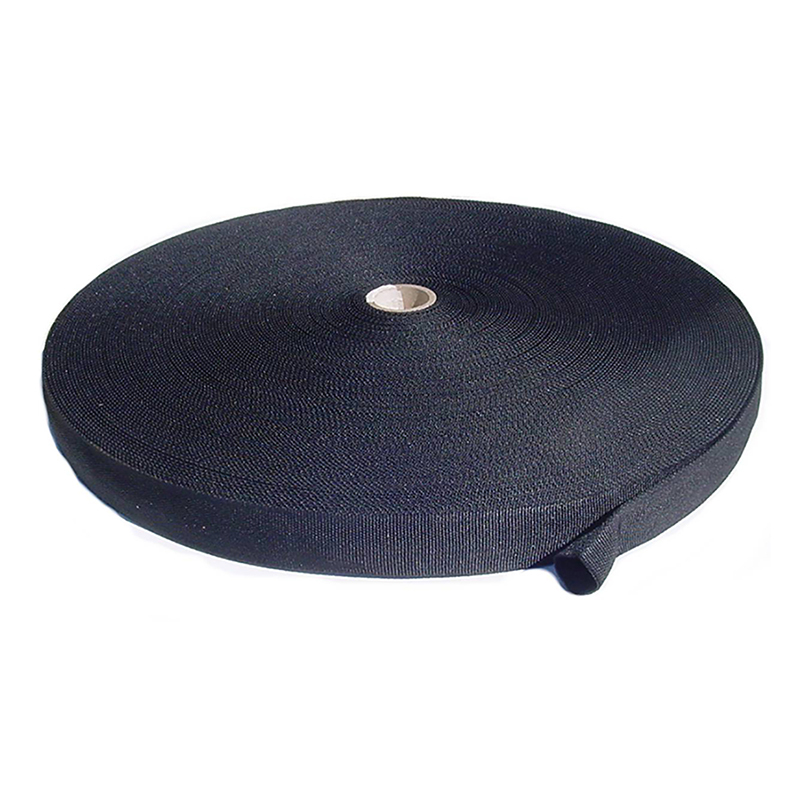 Polyester Round Slings available in approximate diameters of 5/8" Regular Duty , 7/8" Heavy Duty, 1-1/8" Extra Heavy Duty Polyester Round Slings are the most durable Lifting Slings. 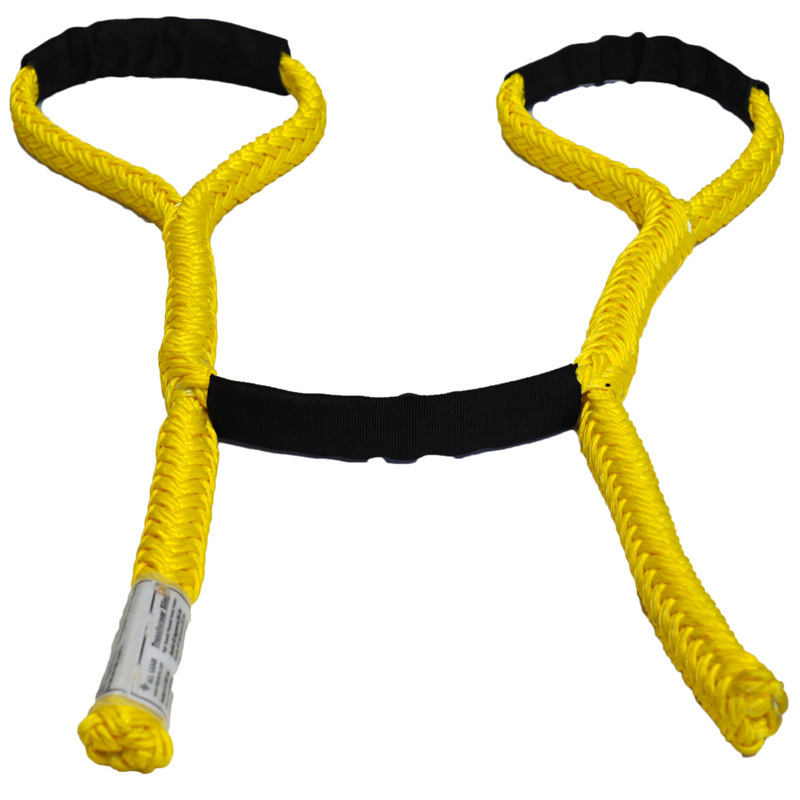 Double Head Eye Sling - 12-Strand Polyester and 12-Strand Multi Pro™ coated in All Gear's Husky Coating and covered with Chafe Sleeve. 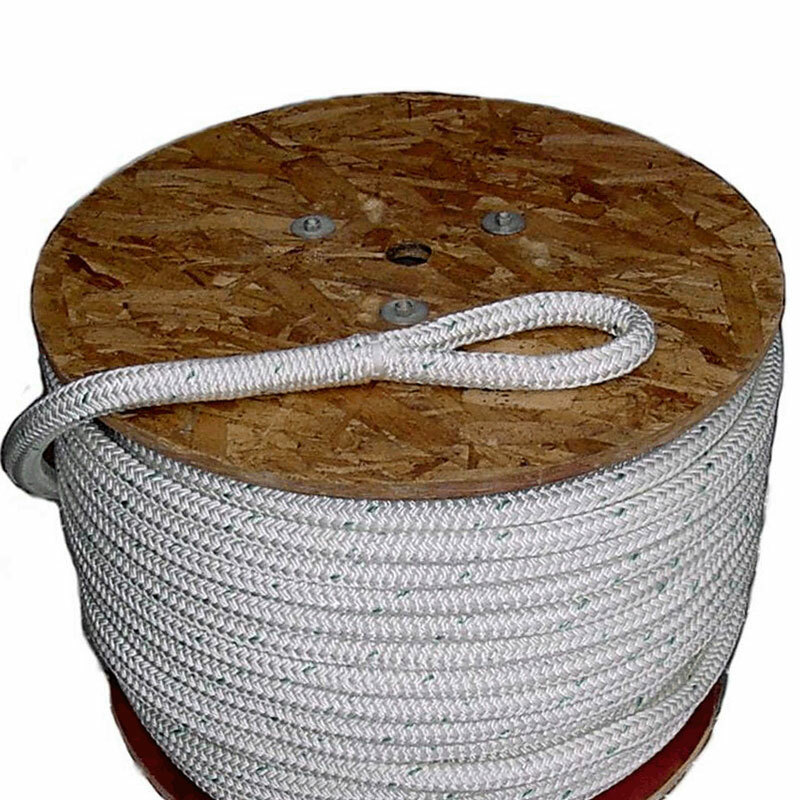 3/4" x 16' has two 1-1/8" Low Friction Ring installed with a Locking Brummel Splice. 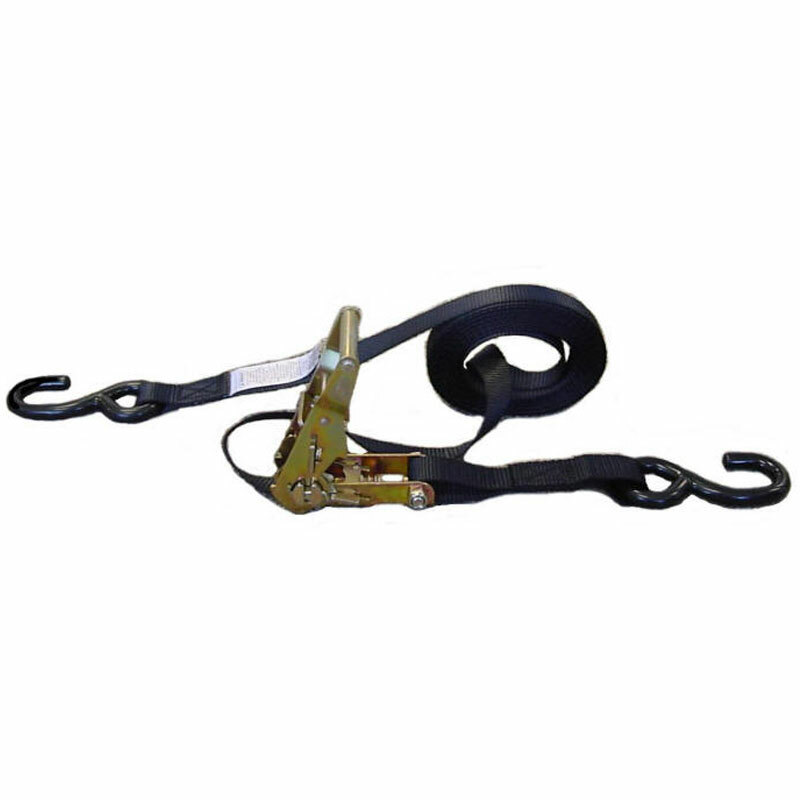 12-Strand Adjustable Double Headed Polyester Slings are used as a low stretch anchor point for arborists and as lifting/ lowering tool for contractors. 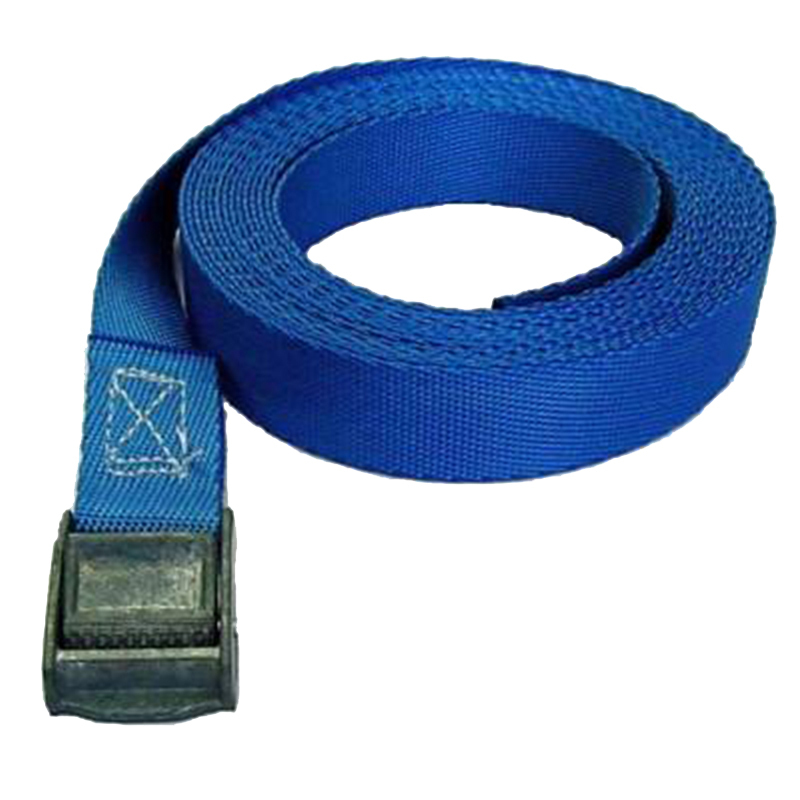 12-Strand Polyester Adjustable Sling. 1/2" adjusts 2-5 feet and the 5/8" adjusts 3-8 feet. The Husky-12™ Adjustable Slings have a Ballistic Nylon Outer Jacket at the Eye for Extended Life. 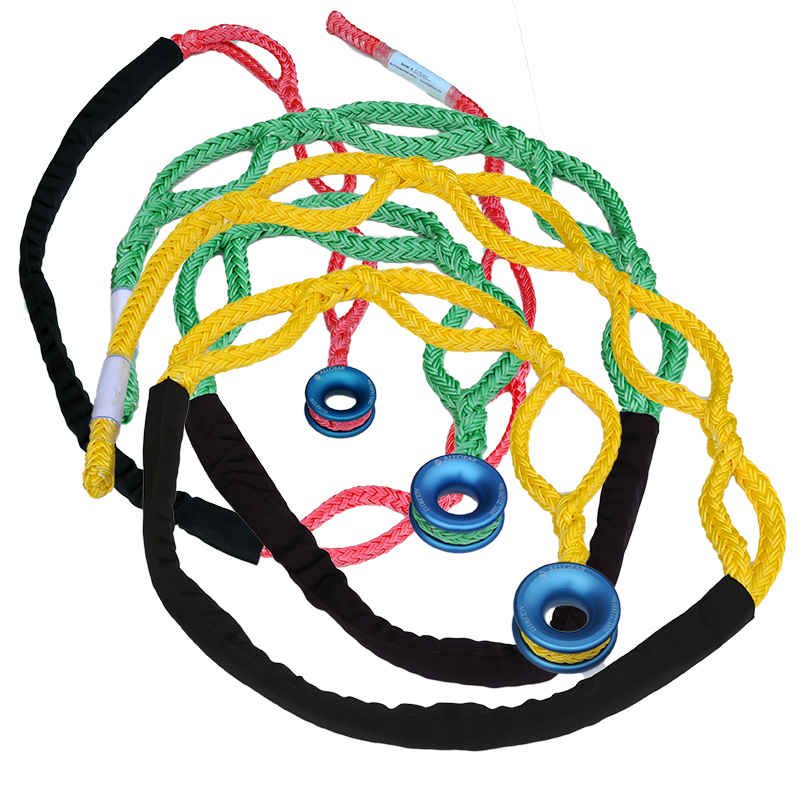 12-Strand Polyester Adjustable Sling. 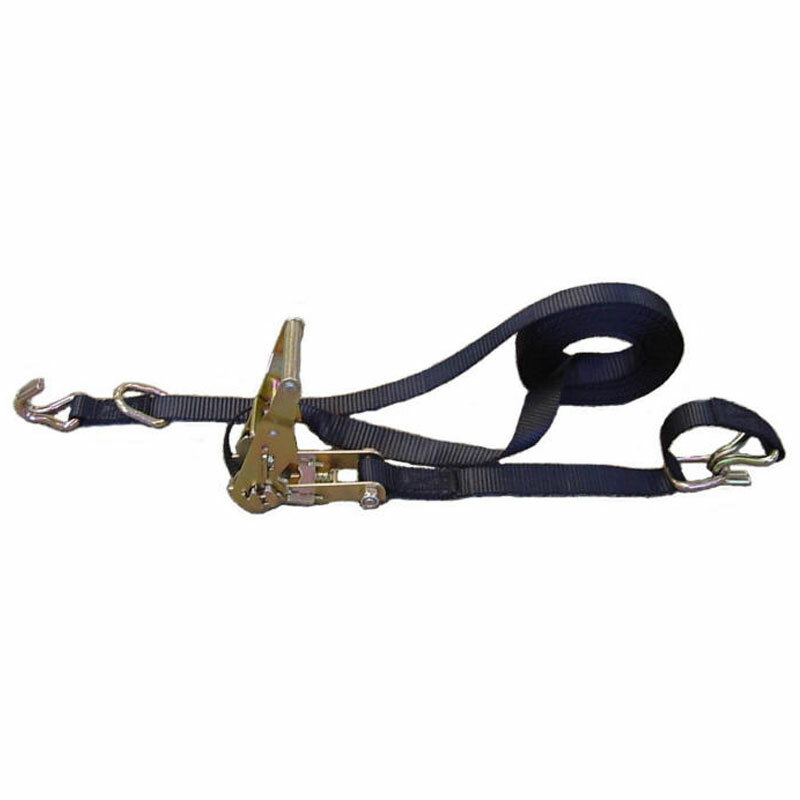 5/8 adjusts 3-7 feet and the 3/4" adjusts 4-7 feet. The Husky-12™ Adjustable Slings have a Ballistic Nylon Outer Jacket at the Eye for Extended Life. 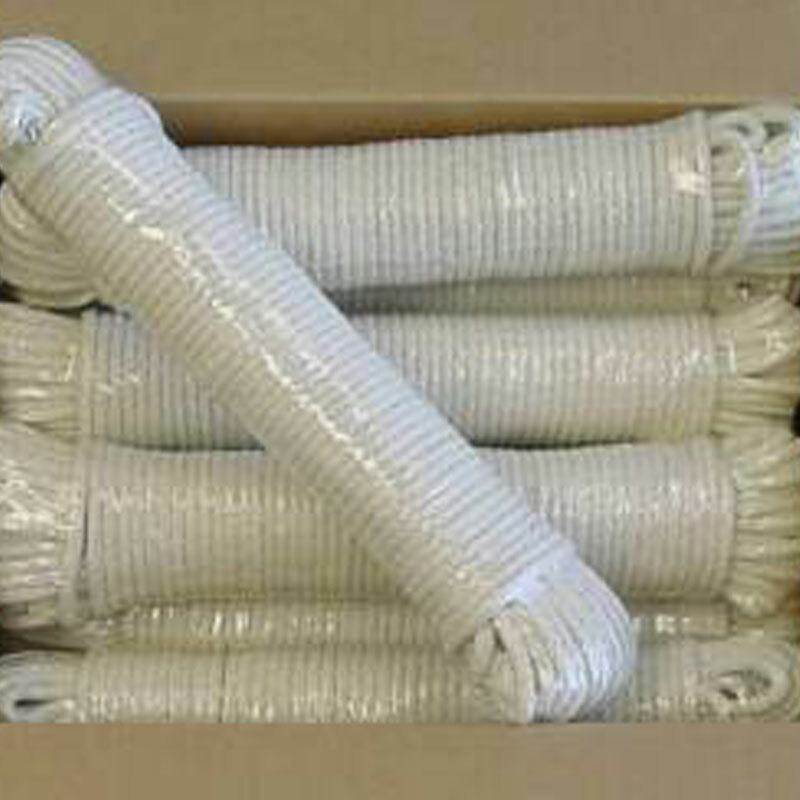 12-Strand Polyester Ring Sling. 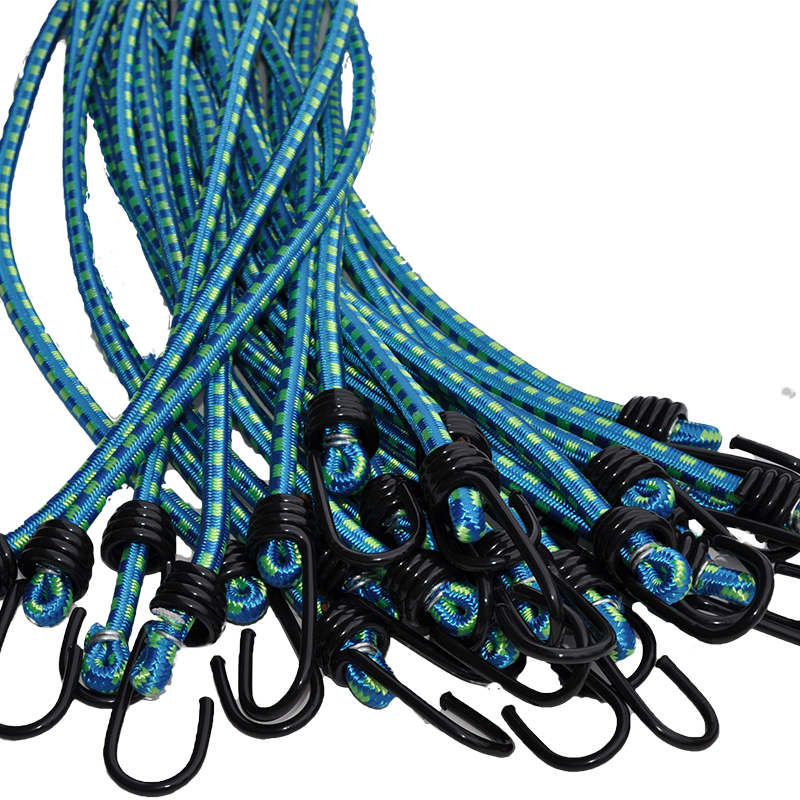 3/8" is 12-Strand TVP, 1/2 , 5/8 and 3/4 are the Husky-12™ Polyester with a Ballistic Nylon Outer Jacket at the Eye and Body for Extended Life. 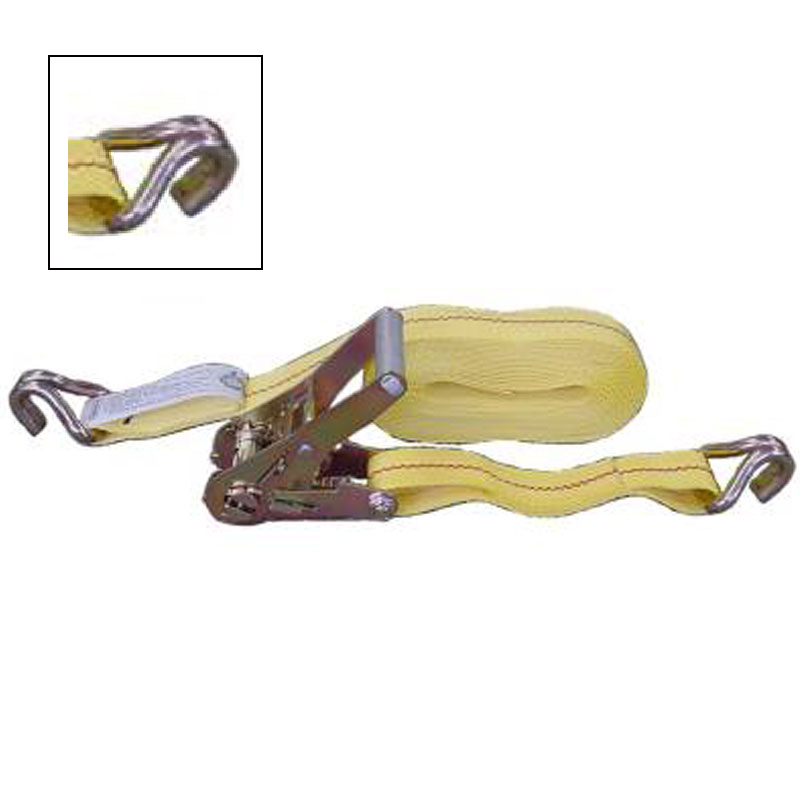 1/2" 16-Strand with a Steel Locking Snap allows you to adjust and it has a Sewn over end. 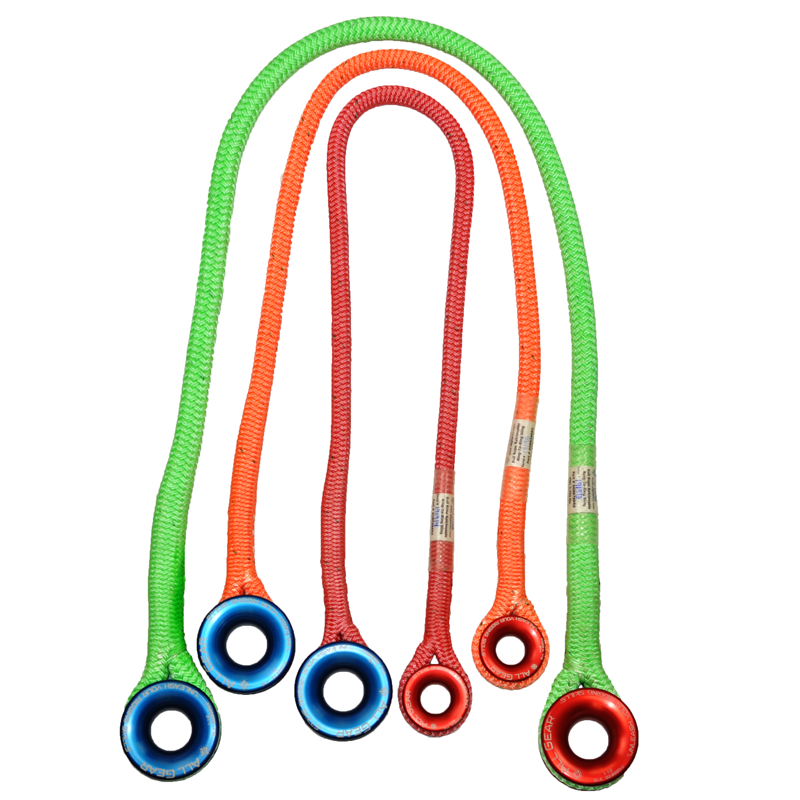 7/16" 32-Strand with Aluminum Locking Snap allows you to adjust and it has a Sewn over end. 1/2" Husky Bull Rope with Two Steel Hooks and One Aluminum Hook on the 3/8" Double Braid Composite Prusik. ANSI and OSHA Certified. 24 and 32-Strand Adjustable Lanyard. 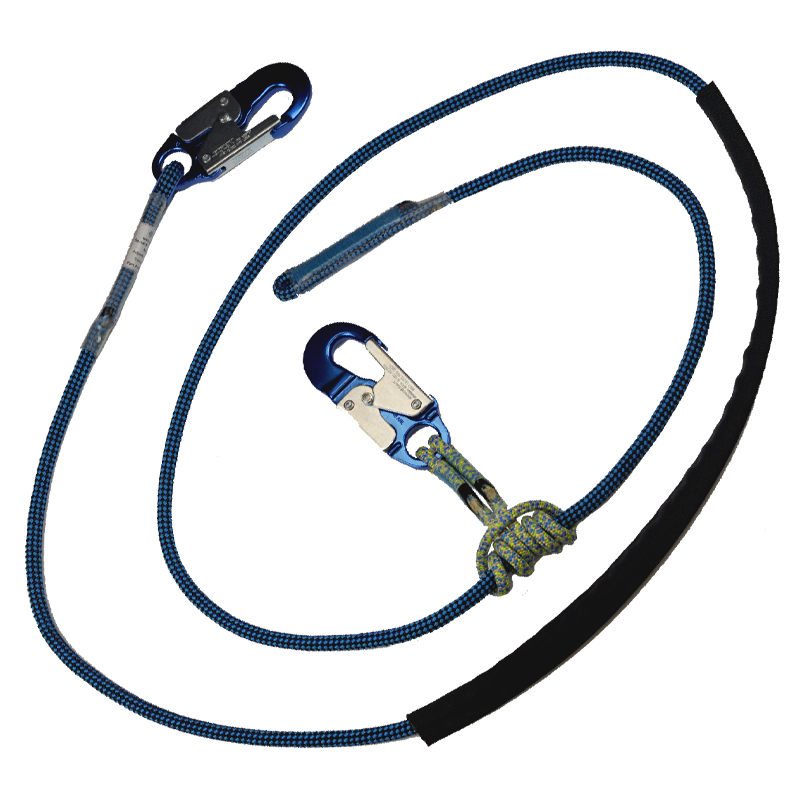 24 and 32-Strand Climbing Line with Aluminum Hook and a Sewn over end. 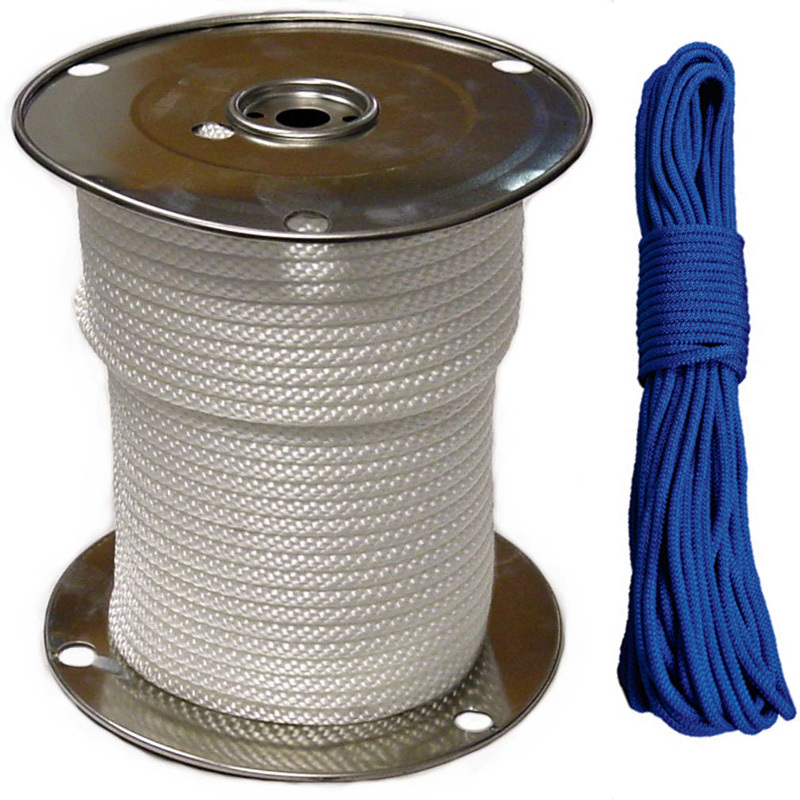 1/2" 16-Strand with a Steel Hook allows you to adjust and a Sewn over end. 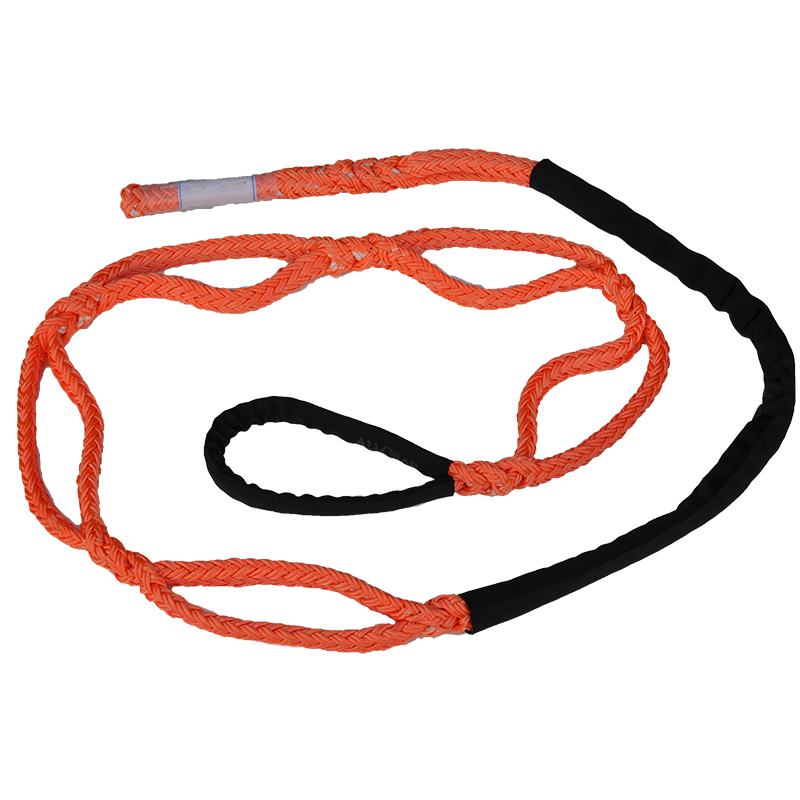 Extremely Durable 1" Polyester Webbing Lanyard which can be adjusted from 4' to 6'. 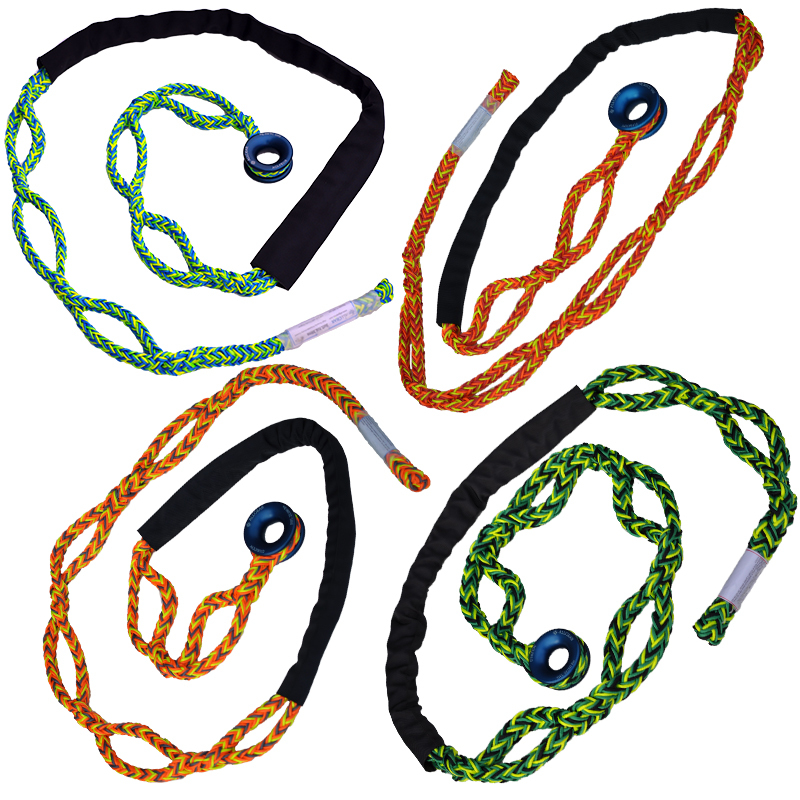 Reusable tube of 5 fids and instructions to splice your own ropes. 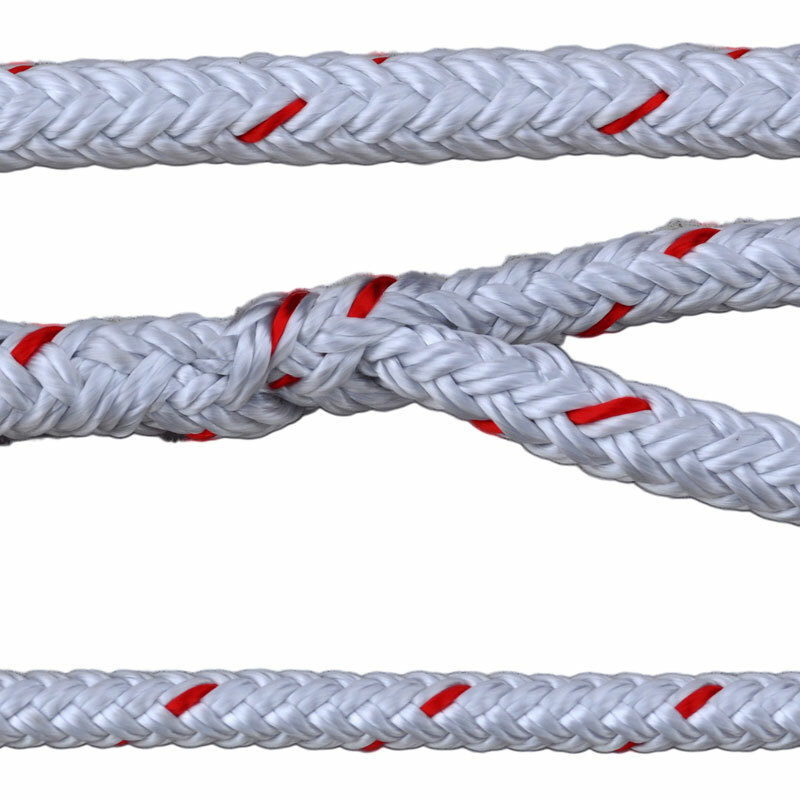 Splice Hollow Braided, 3-Strand Twisted, or Double Braided ropes. The finest grade steel of precise chemical analysis, #26 or .063 in size. Exceedingly uniform in thickness and roundness makes it the finest available. 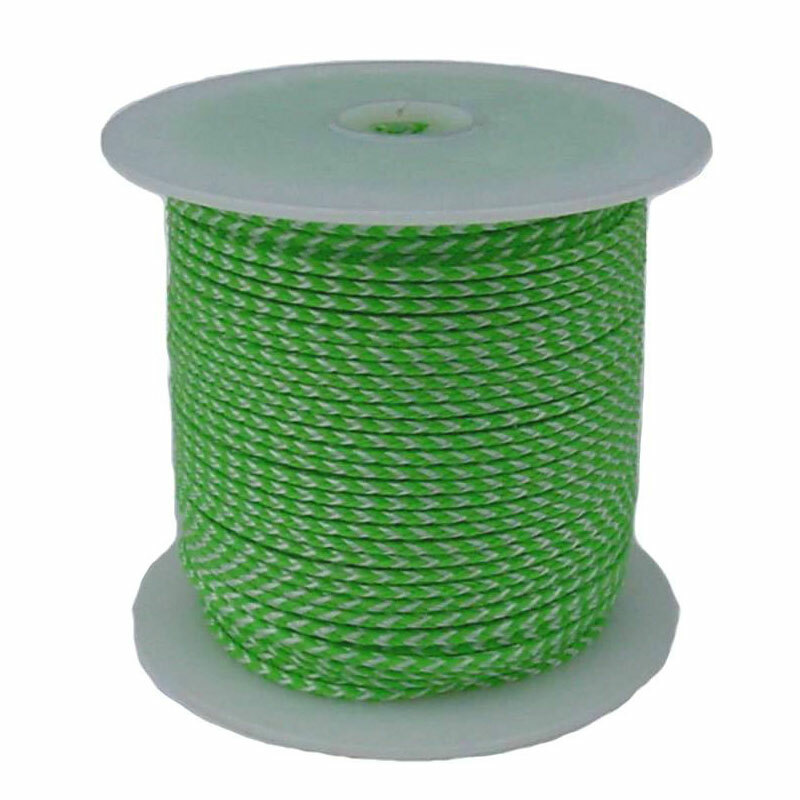 Polyester Waxed Twine is the ultimate for Splicing. 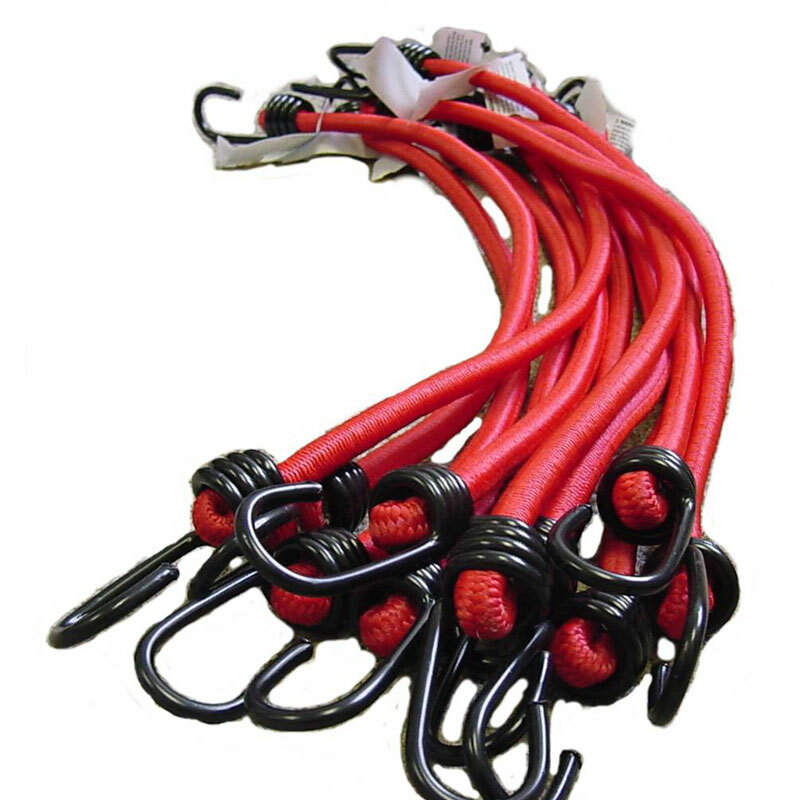 Easy to setup with a slip knot. 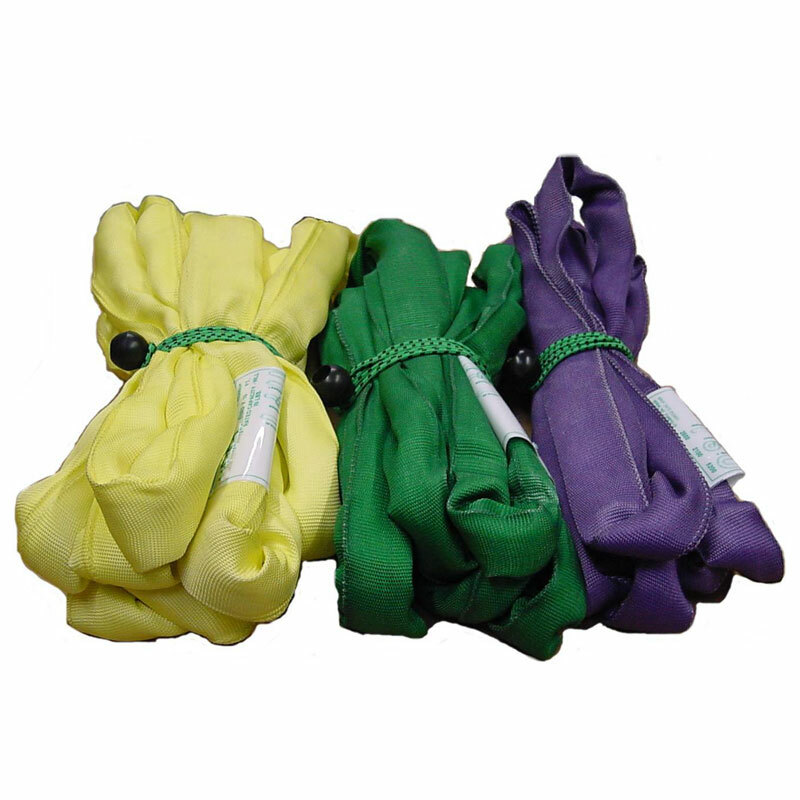 Our Heavy Duty Polyester Chafe Sleeve will provide you excellent protection for your tree in a Branch Saver system or as an excellent rope protector for climbers. 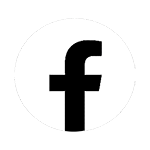 All Gear's Low Friction Rings or LFR's are made from Top Grade American Aluminum with an Aircraft Quality Teflon Coating for Glide. Uniquely ours - all ring sizes are available in Blue or Red - Please specify color when ordering. 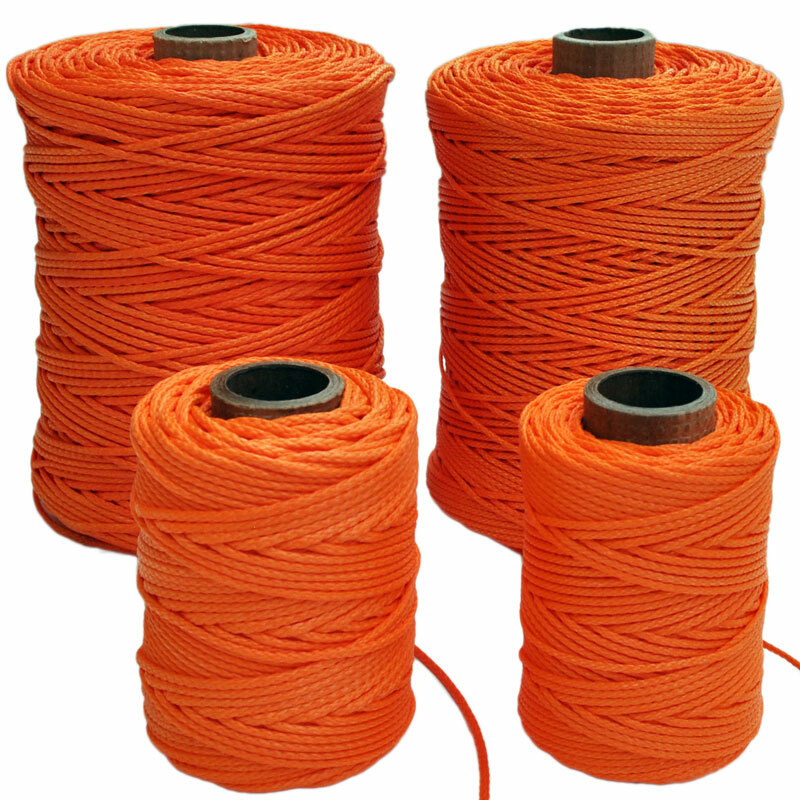 Available in 3/4", 1 1/8", and 1 1/2"
#7 or 7/32" through #16 or 1/2" Solid Braided Cotton. Made from 100% Cotton (No polypropylene core). Soft natural cotton finish. Solid Braid Nylon for extremely good long wear life. 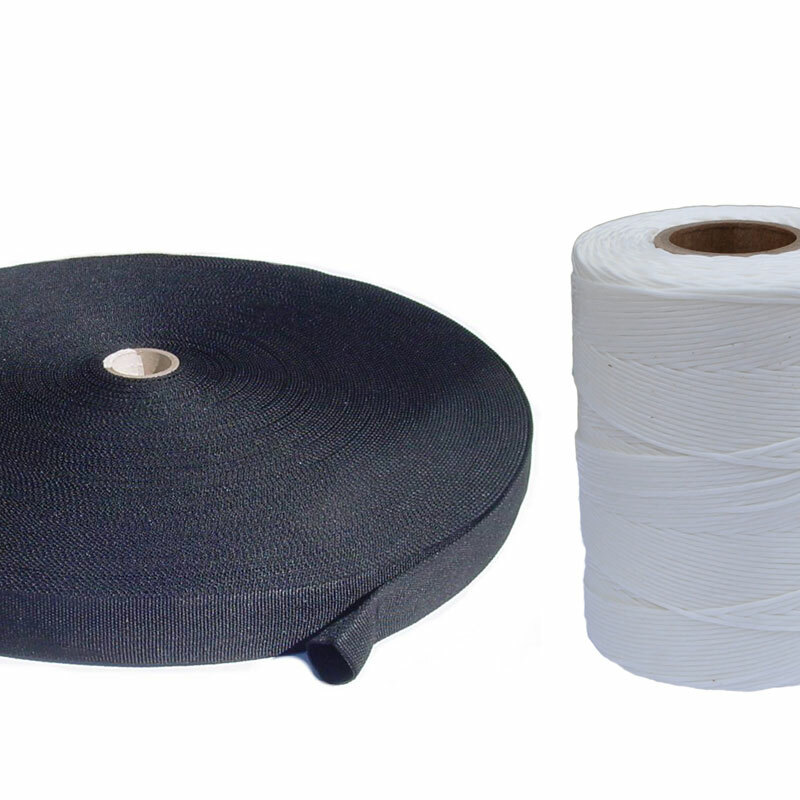 24- Strand Multifilament Polypropylene for a very good economical alternative. 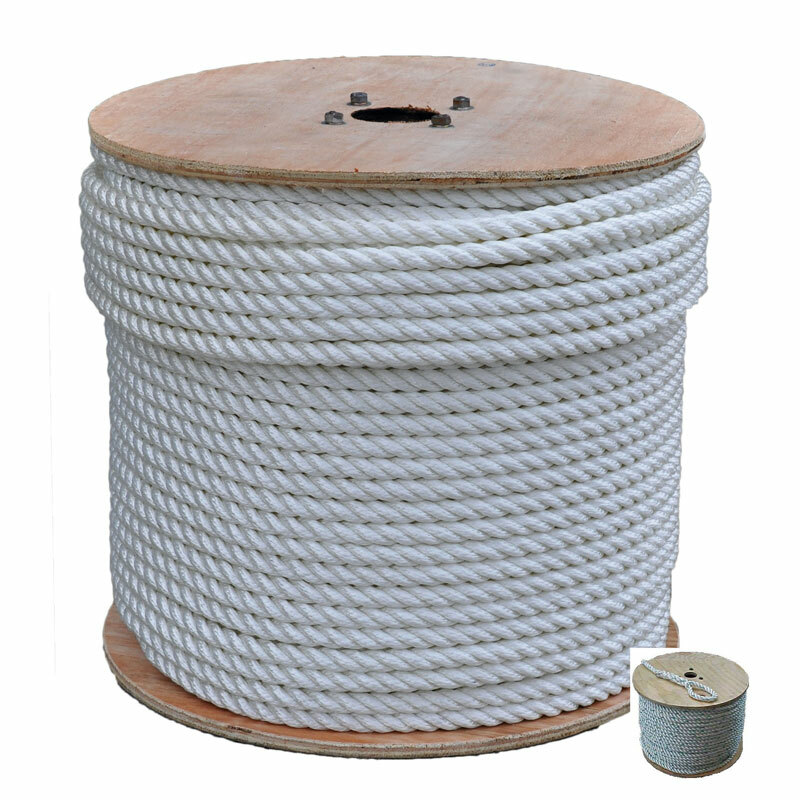 Excellent for Mason Line, Chalk Line, Netting Line, Plumb Line and Recreational Line. Available in White, Yellow, Neon Yellow, Neon Pink, Neon Green, Neon Orange, Dark Green, and Gold. Salt and Pepper is available in Braided only. 6,500' Polypropylene Pulling Twine, White with a Blue Tracer. Private Label and Custom Colors Available. 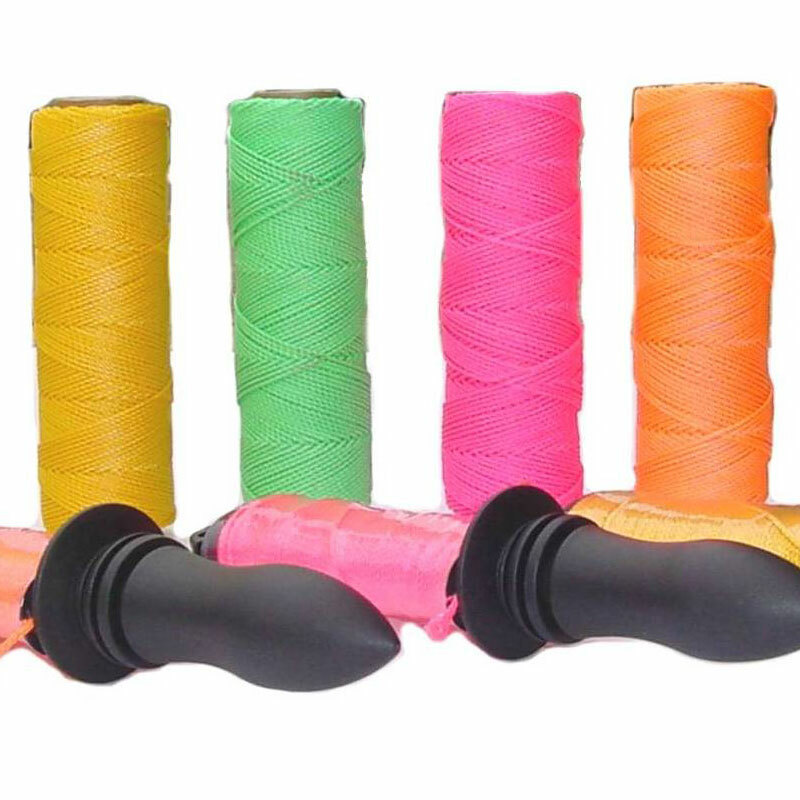 Nylon Chafe Sleeve is excellent for protection of spliced eyes and Polyester Waxed Twine is Great Splicing Twine. 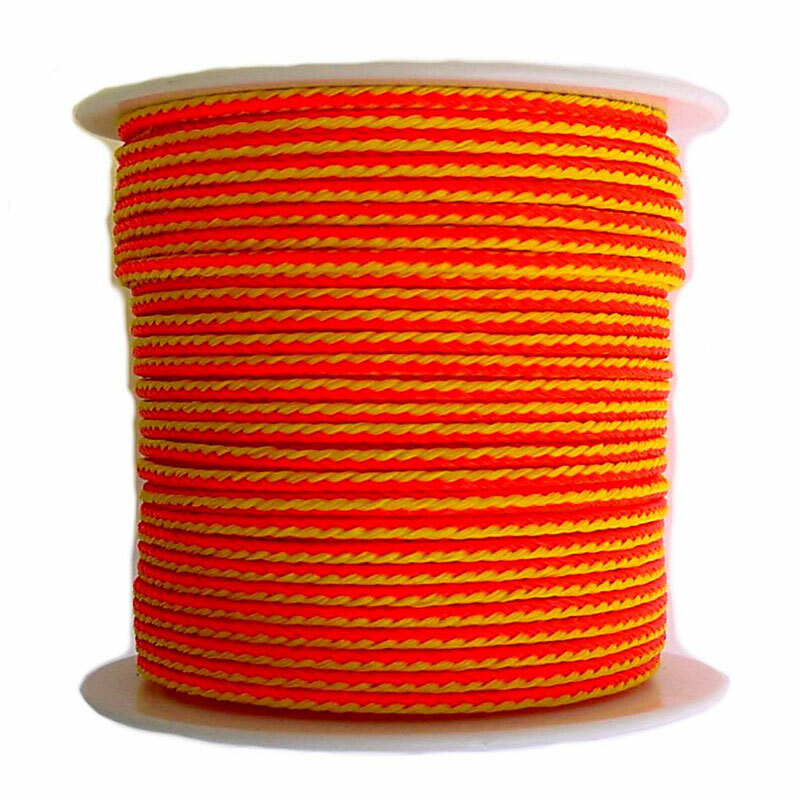 Bright Orange and Yellow Throw Line. Super Slick and Light Weight. 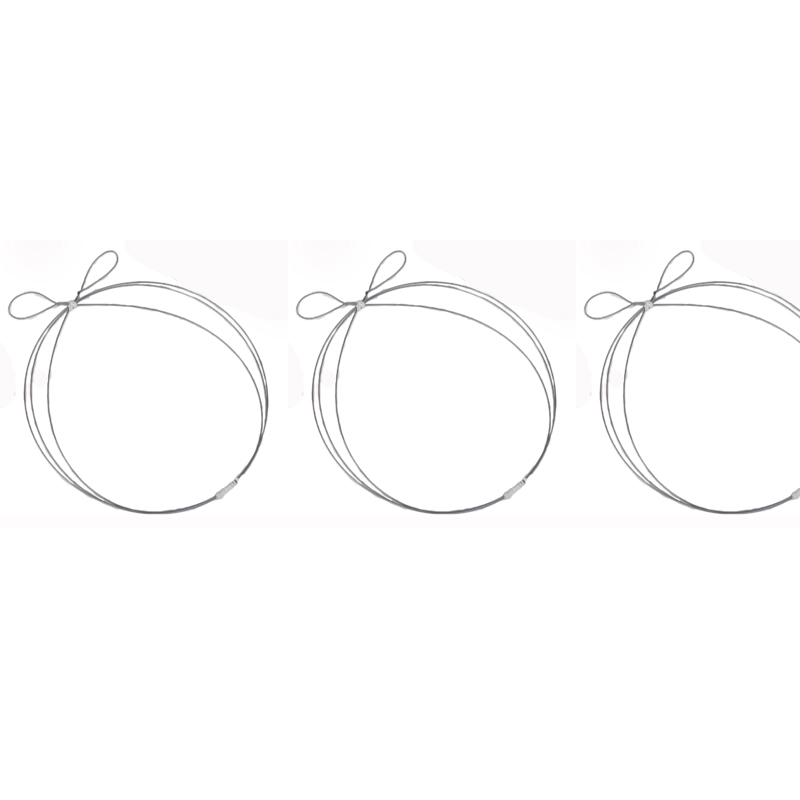 We encourage you to compare to any other poly throw line. Quality Guaranteed. braided firmly to avoid snagging and abrasion. Premium "Husky Coating" is applied to enhance the glide and increase the abrasion resistance even further. 180' or 1,000'. 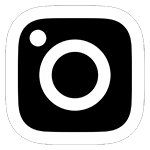 HMPE® is a registered trademark of DSM Corp.
1,250 lbs., 1,800 lbs. and 2,500 lbs. Pull Tape marked sequentially every foot for measurement. 3,000' and 5,000' Lengths are available.